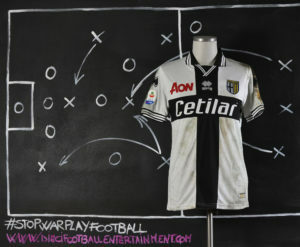 In the 1994-1995 season, Parma Calcio had arguably its most successful season ever, thanks to a third-place finish in Serie A with the same points as runner-up Lazio, plus a victory against Juventus in the UEFA Cup Final. 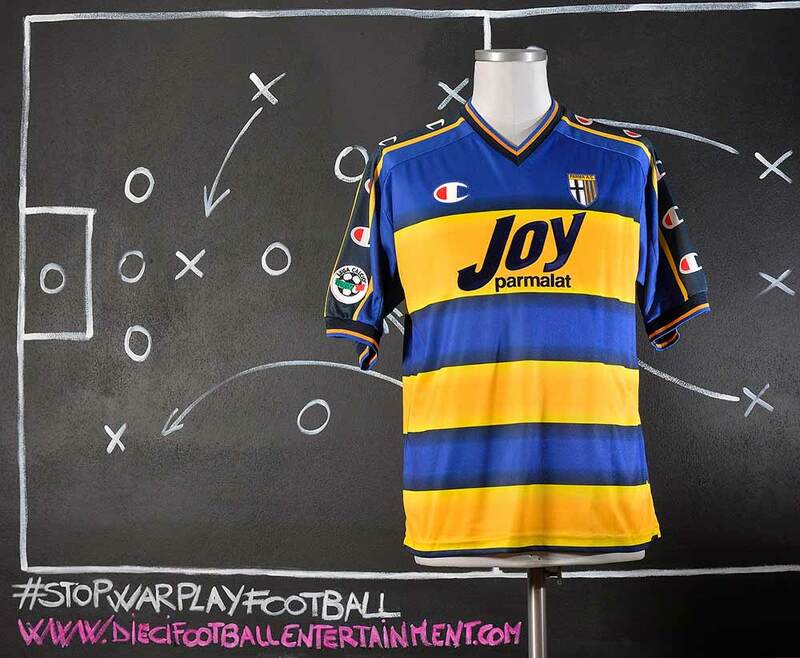 It also reached the Coppa Italia Final, where they were defeated by Juventus. 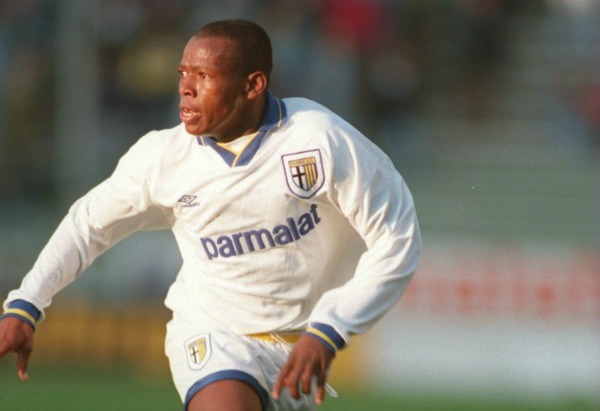 Asprilla was instrumental in Parma’s run to the UEFA Cup Final, with three goals over two legs in the semi final against Germany’s Bayer Leverkusen. 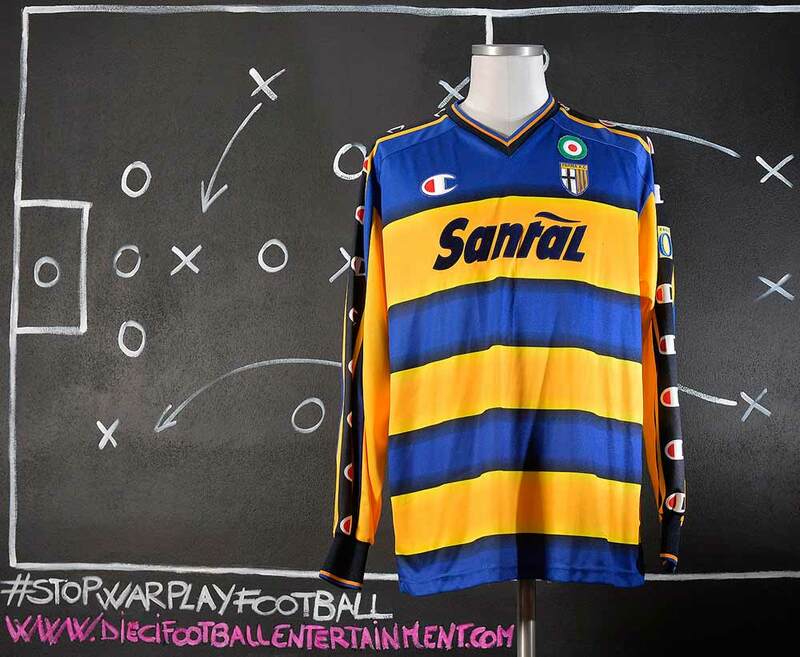 In the final itself, Asprilla was in the starting XI for both legs as Parma defeated Juventus 2–1 on aggregate. 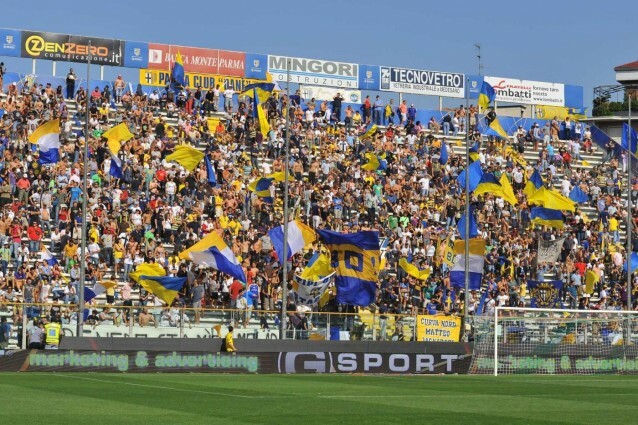 Parma Associazione Calcio played its sixth consecutive Serie A season, which was the last under legendary coach Nevio Scala, who stepped down at the end of the season. 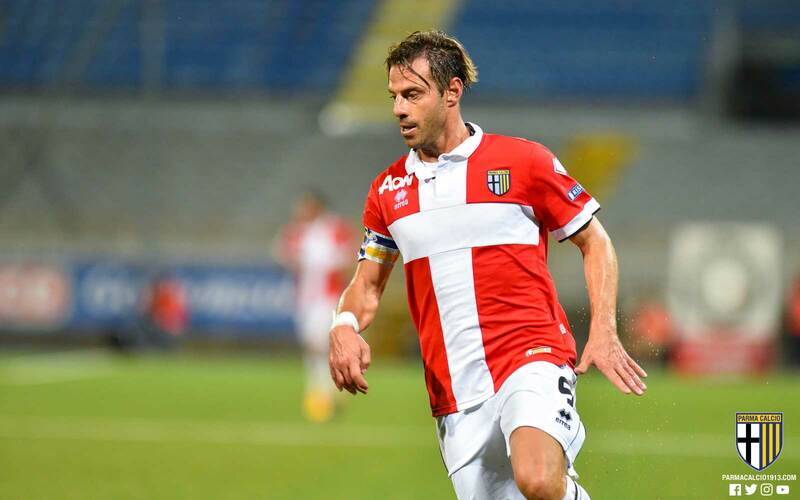 Defensive stalwarts Alberto Di Chiara and Lorenzo Minotti also left the club following the season’s conclusion. 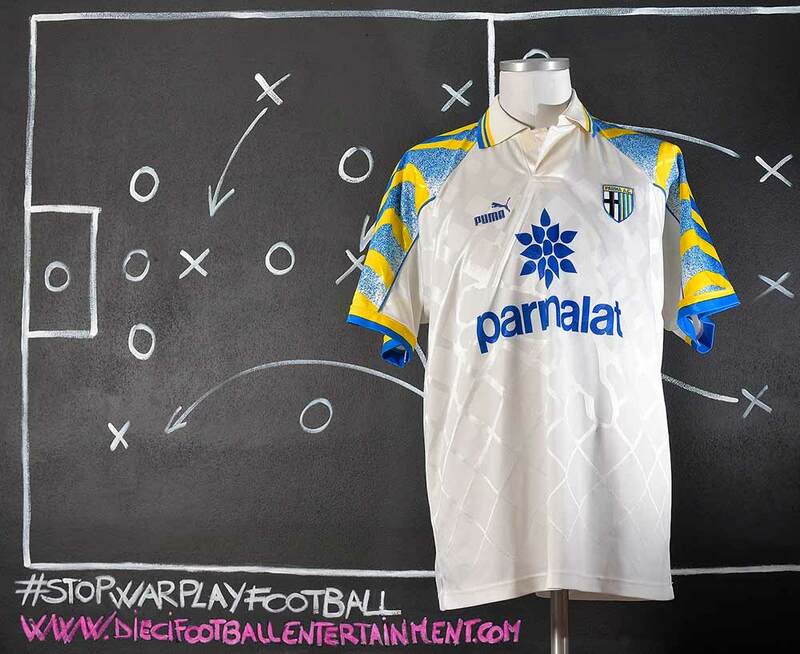 Despite being only one point behind third-placed Lazio, Parma finished 6th in the standings. 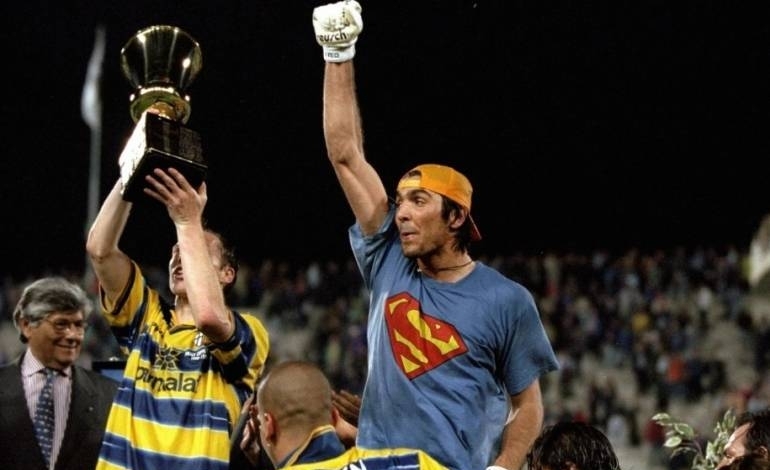 In contrast to the previous four seasons, Parma did not win any cups either. 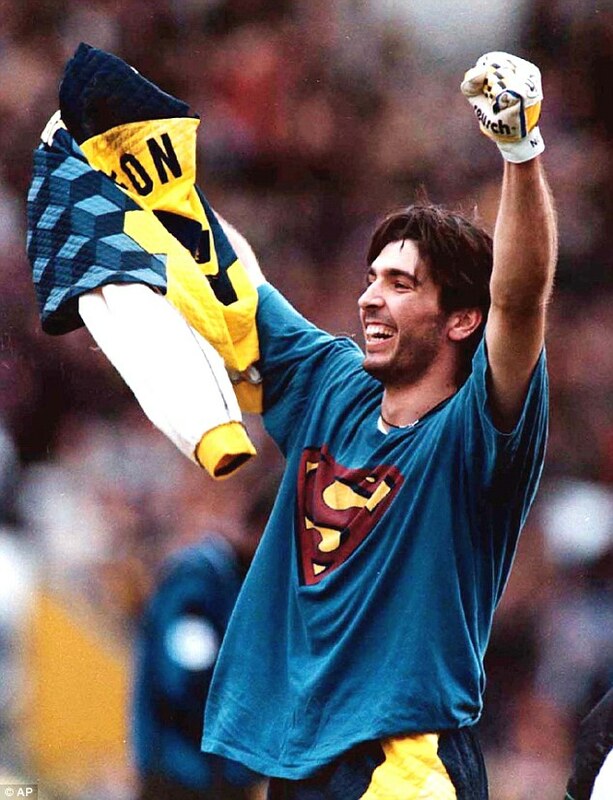 The most significant moment of Parma’s season was the debut of the club’s new superstar, 17-year-old goalkeeper Gianluigi Buffon, who saved a penalty on his debut against A.C. Milan. 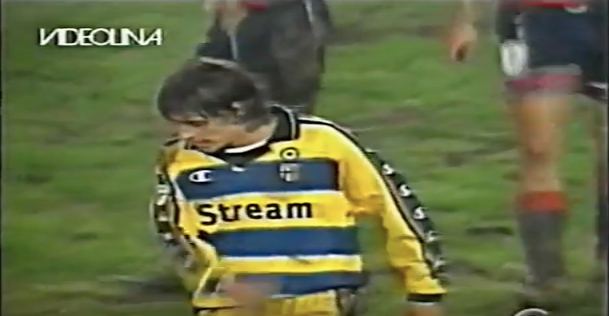 Parma came the closest it had ever been to winning the Italian championship, but came up short by finishing only two points against Juventus. 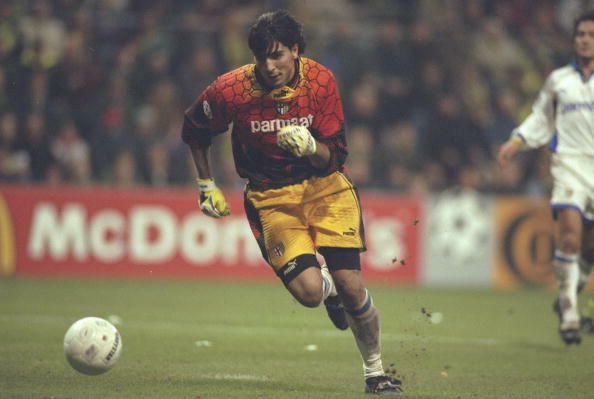 Young goalkeeper Gianluigi Buffon, along with new recruits Lilian Thuram, Enrico Chiesa and Hernán Crespo, proved to be the driving force in Parma’s title bid, which nearly reached ultimate success. 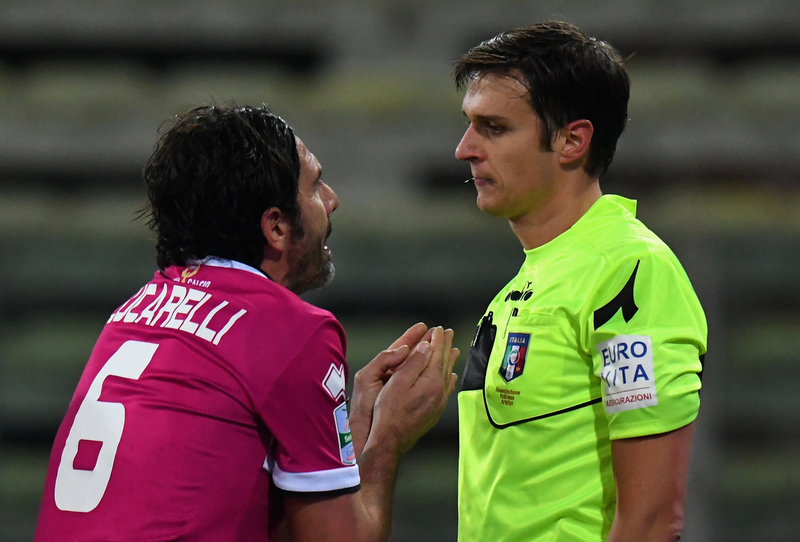 However, a dubious penalty for Juventus in a 1–1 draw against the Turin club in May sealed Juventus’ title. 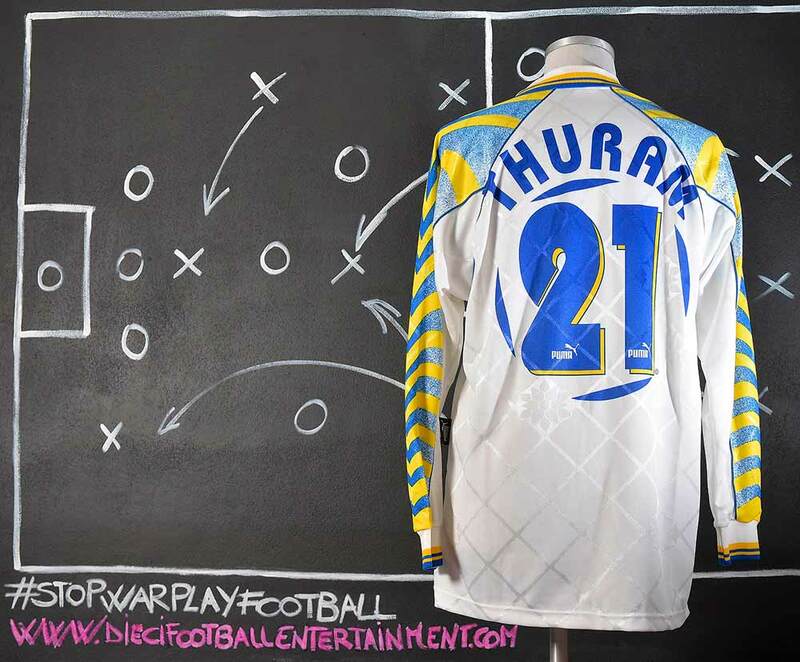 In July 1996, Thuram made a high-profile transfer to Italy to join Serie A club Parma. 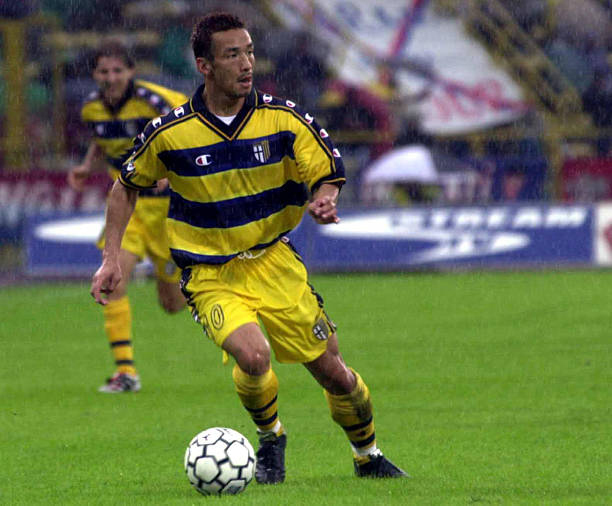 In his first season, he made over 40 appearances for the club in all competitions, scoring one goal, as Parma finished second in the 1996–97 Serie A to Juventus. 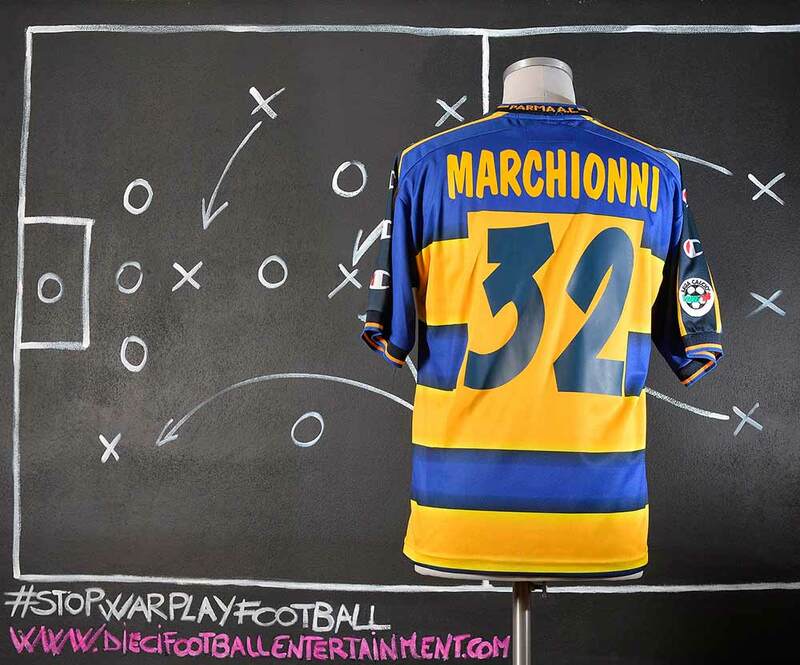 He maintained a starting position in defence throughout his time with Parma, making 163 Serie A appearances and scoring one league goal. In all, he made over 200 appearances for the club, really making a name for himself, also earning caps for France. 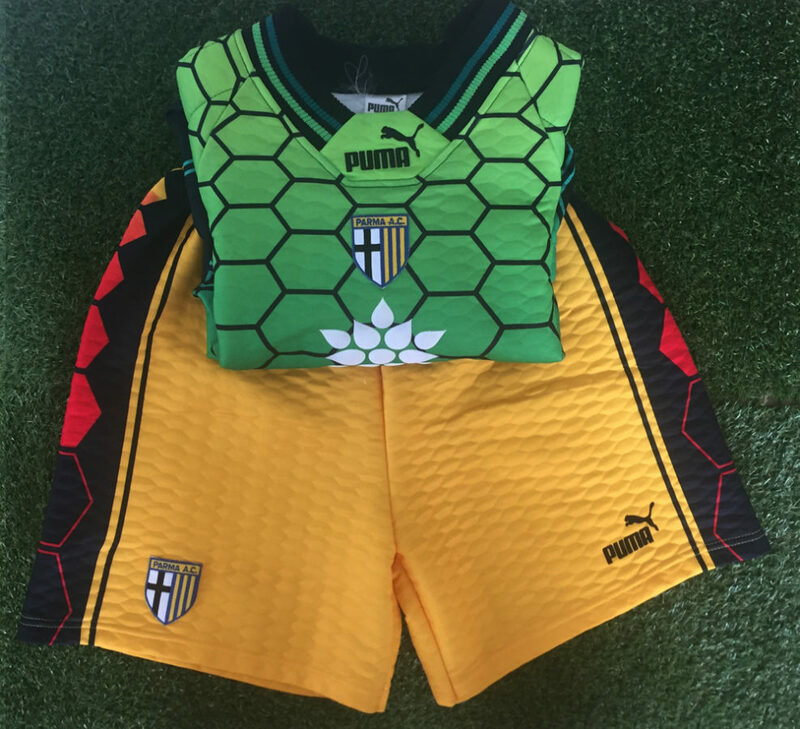 Following another overly impressive season in 2000–01, where Parma reached the Coppa Italia final, and finishing the Serie A season in fourth place, Thuram, along with teammate Gianluigi Buffon, transferred to Juventus. His transfer cost the club 80,000 million Italian lire (€41,316,552). 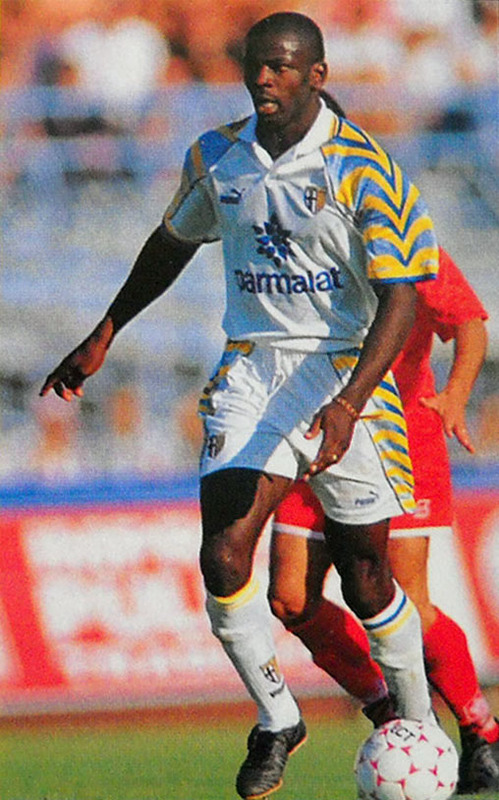 While at Parma, along with eventual Juventus teammates Buffon and Fabio Cannavaro, Thuram won both the UEFA Cup and the Coppa Italia during the 1998–99 season, immediately followed by the 1999 Supercoppa Italiana. 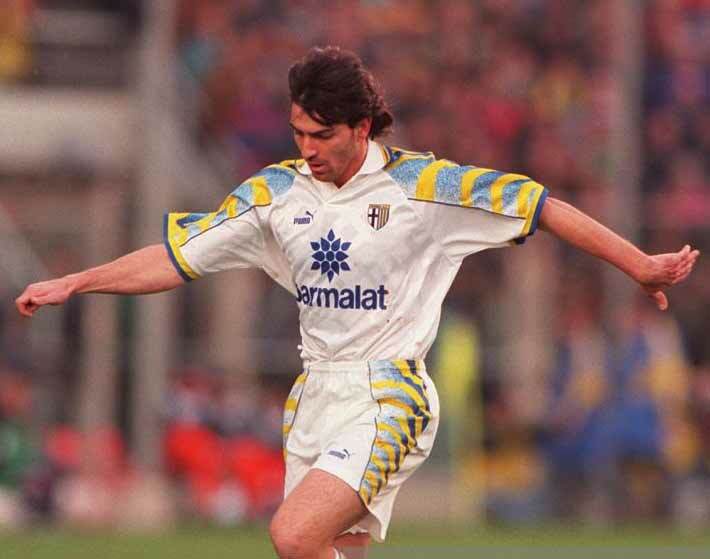 After a few years in the third and second levels (winning the 1992–93 Serie B title with AC Reggiana), Bucci made his Serie A debut playing for Parma F.C., in a league match against Udinese Calcio on 29 August 1993. 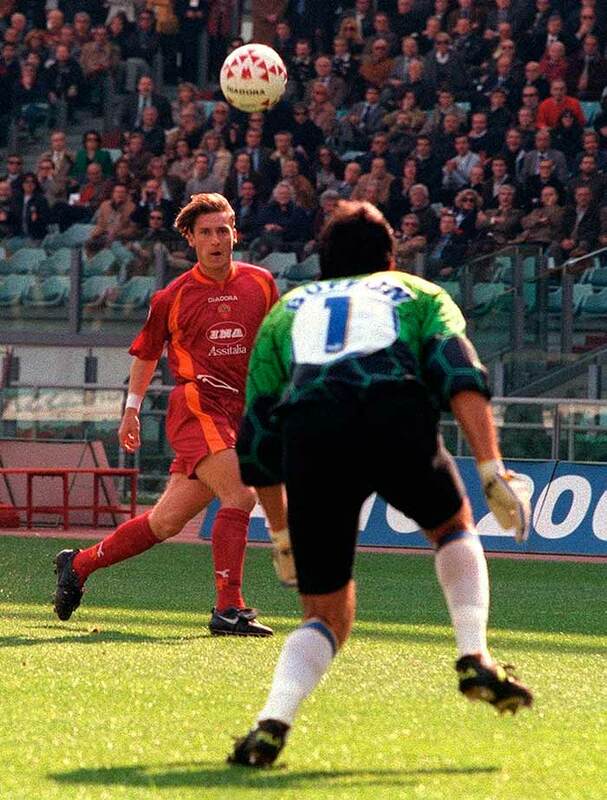 He soon achieved prominence during a particularly successful stint with the club, winning an UEFA Supercup in 1993, and an UEFA Cup in 1995; he also received runners-up medals in the Coppa Italia, in the Cup Winners’ Cup, and in Serie A with the club. 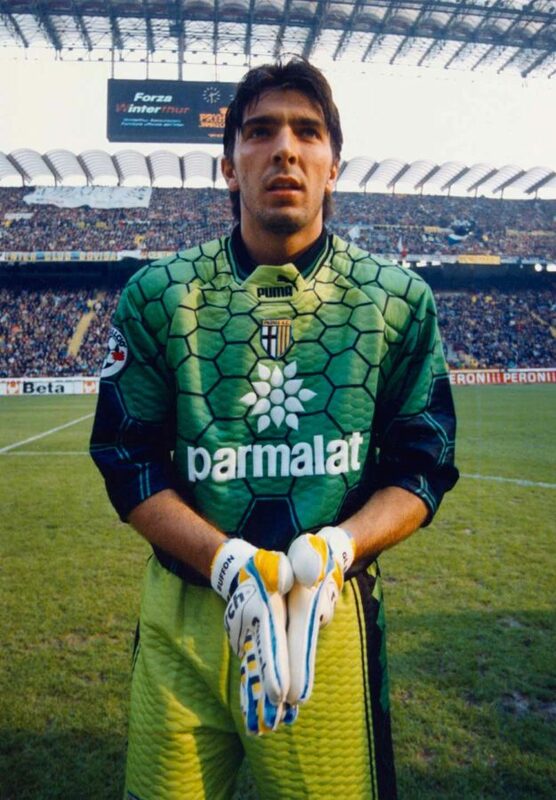 At Parma, however, Bucci was soon overtaken by the emergence of 17-year-old Primavera keeper Gianluigi Buffon during the 1996–97 season, which moved Bucci to leave the team in order to play more regularly. 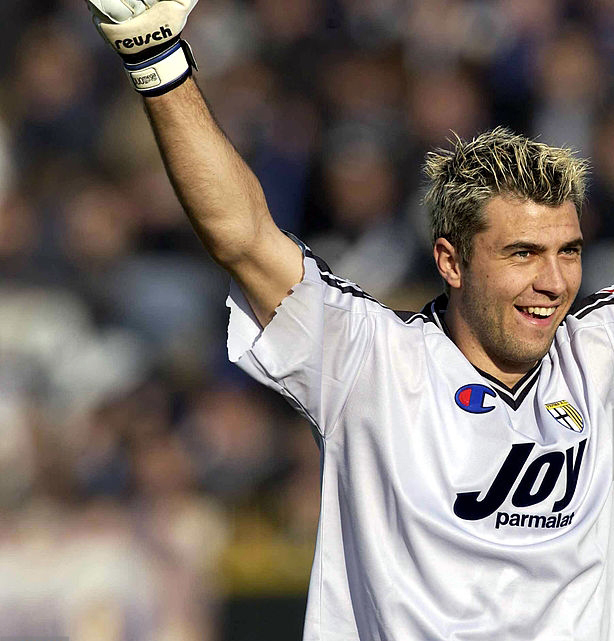 After six months without a club, Bucci moved back to Parma in January 2005 to replace Gianluca Berti who left for Torino F.C., initially as a reserve goalkeeper. He was the first choice after Sébastien Frey’s departure, ahead of Cristiano Lupatelli and Matteo Guardalben in the 2005–06 season, Alfonso De Lucia and Fabio Virgili in the 2006–07 season, Nicola Pavarini and Radek Petr in the 2007–08 season. 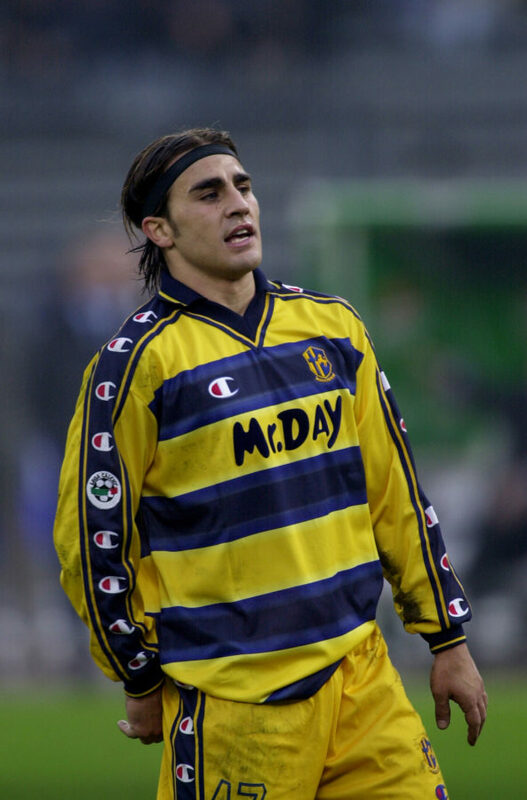 After Parma’s relegated he was released in June 2008. 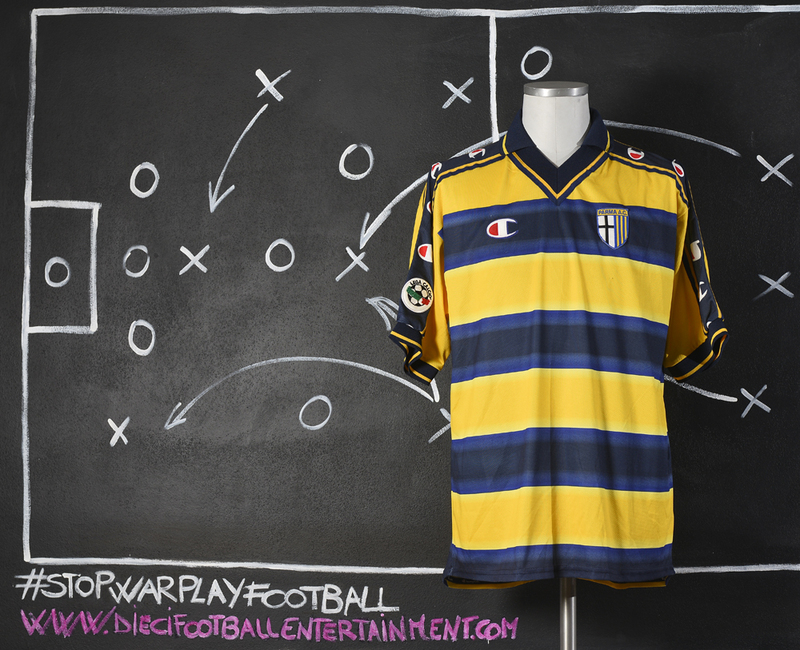 In the 1997–98 season, Parma finished in fifth place in Serie A and reached the Coppa Italia semi-finals, whilst they were knocked out in the group stage of the Champions League, finishing second in their group to defending champions Borussia Dortmund. 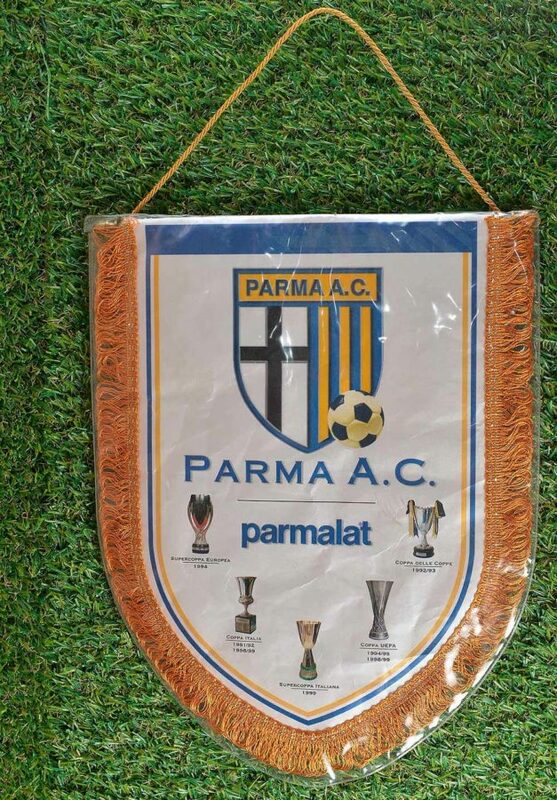 The 1998-1999 was an amazing season for Parma. 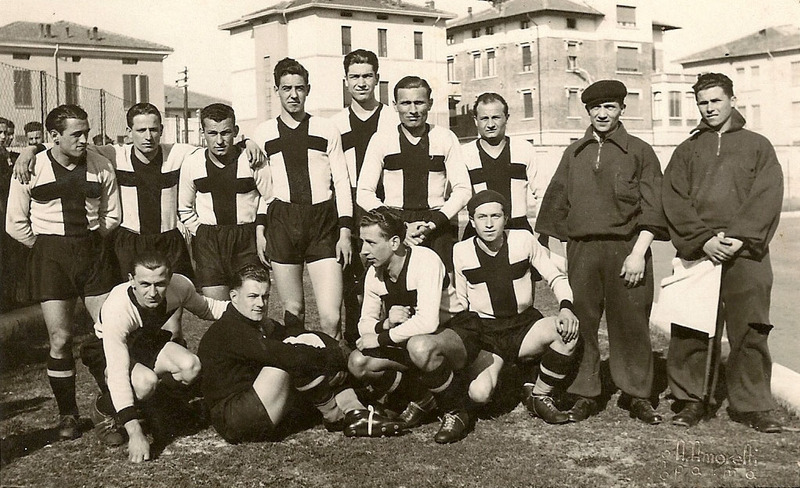 The team won two trophies in one of the club’s most successful seasons. The Coppa Italia win over Fiorentina was followed by a spectacular 3–0 victory against French giants Marseille in the UEFA Cup Final. 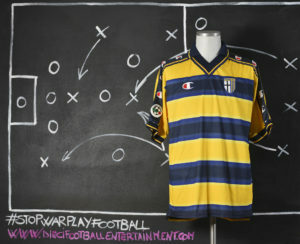 In the league, Parma could not quite match Milan and Lazio, but managed to clinch the fourth and final Champions League spot. 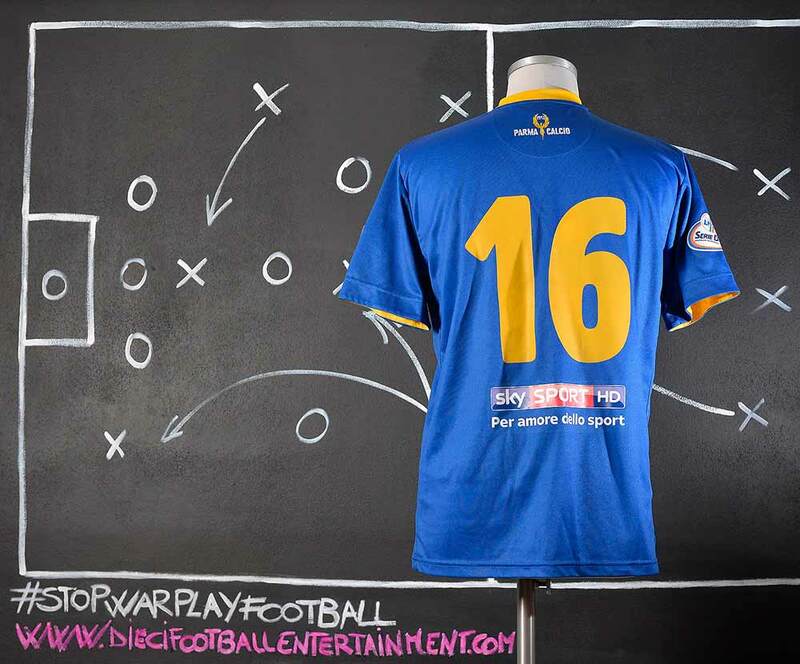 This kind of jersey with STREAM sponsor was used by the team only during the Tim Cup games. 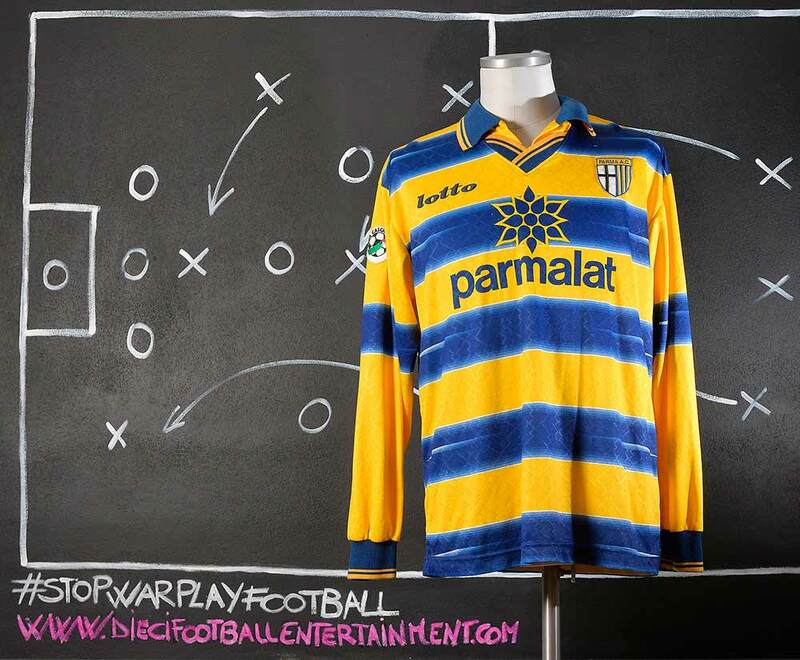 The regular Serie A sponsor of the season was Parmalat. 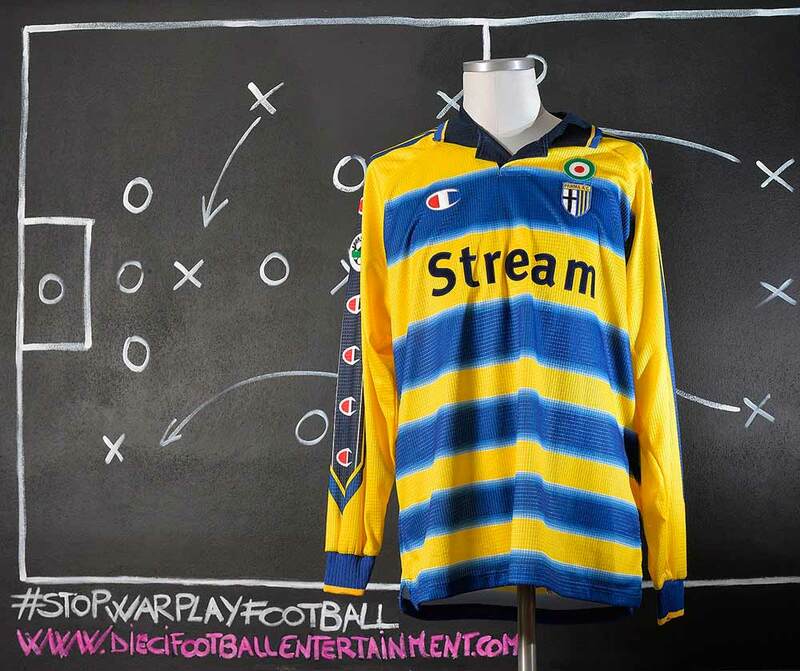 STREAM was a pay per view cable tv that agreed with other Italian professional teams like Lazio S.S. and Roma A.S. for example, to be sponsor on their shirts for Tim Cup games only. 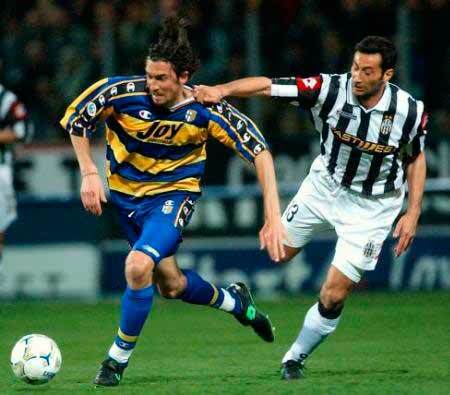 2000-2001 was the last season for two big players of Parma with the team. 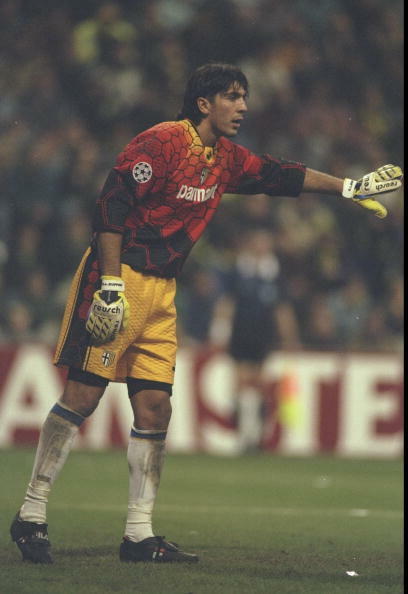 Still young, Gianluigi Buffon played out his final season with the club, along with defender Lilian Thuram. 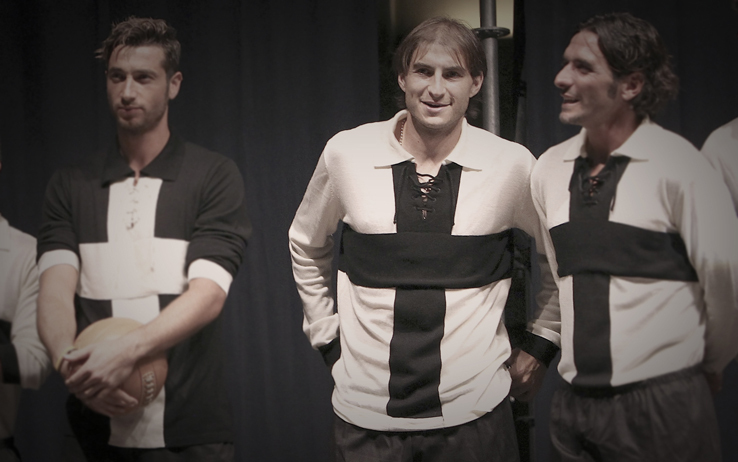 Both were sold to Juventus in the summer, and their absence was clearly felt in the 2001–02 season. 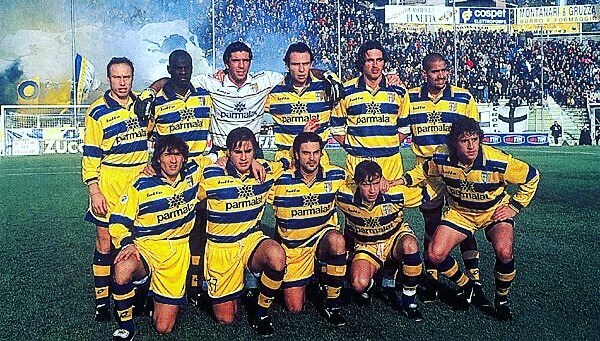 2001 remains the last time Parma qualified for the Champions League. 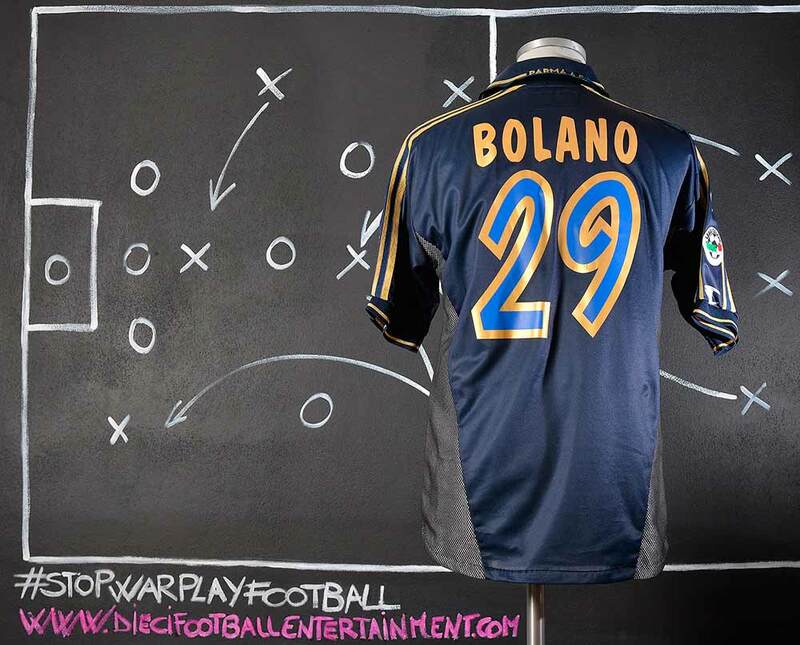 This shirt was used by Alain Boghossian on September 15 2001 just four days later the tragedy of World Trade Center happened in New York on September 11th. 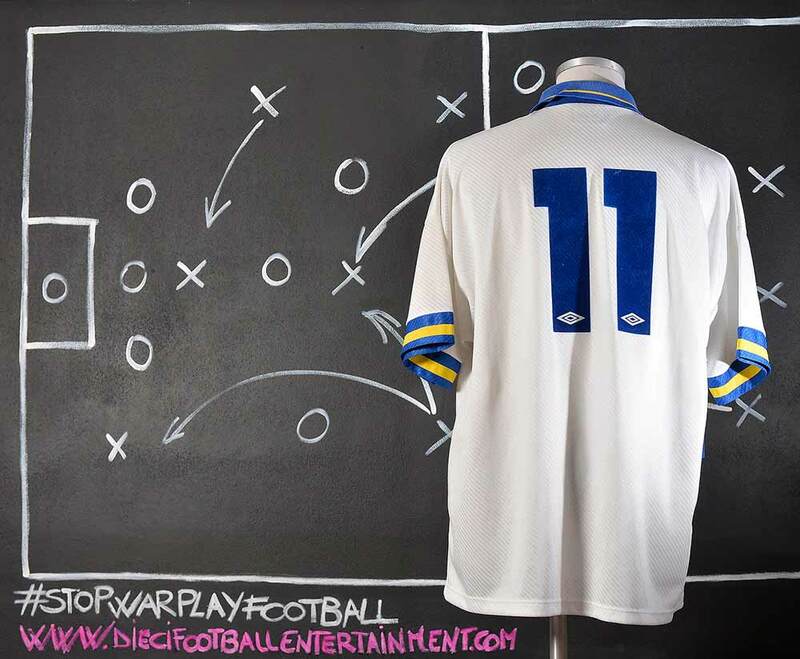 To commemorate this tragedy three Serie A teams, Internazionale F.C., Brescia and Parma decided to play the first game after it without the sponsor on their shirt. While Internazionale F.C. played the game simply hiding the regular Pirelli sponsor with a black drape, the other two teams played the game without any sponsor on chest keeping it completely clean. 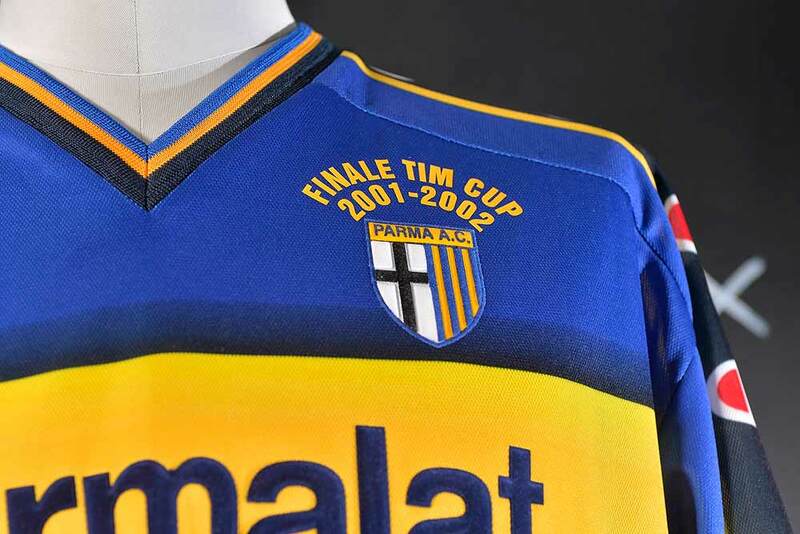 But since the game was just few days after the tragedy so the team’s supplier (Champion) didn’t have enough time to deliver regular season’s shirts without the sponsor, the team used the previous season 2000-2001 shirt totally clean on chest. 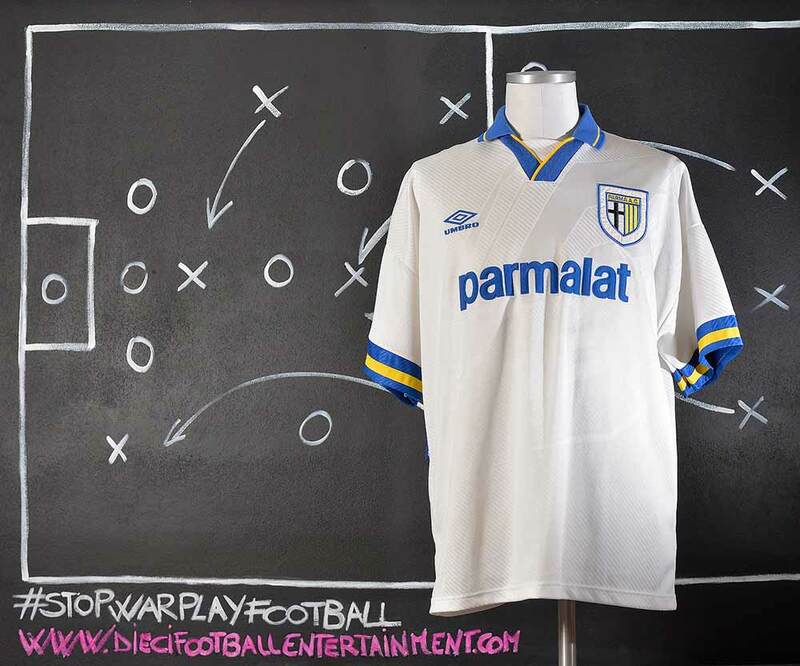 Parma Associazione Calcio suffered a major setback in the 2001–02 season, after selling two of its three key ingredients in defence prior to the season. 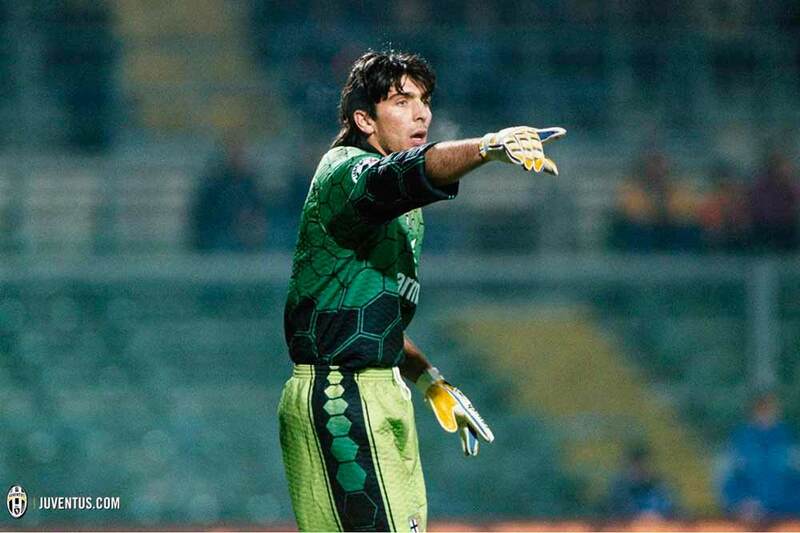 Goalkeeper and former youth-team product Gianluigi Buffon, and France international Lilian Thuram both departed for Juventus. 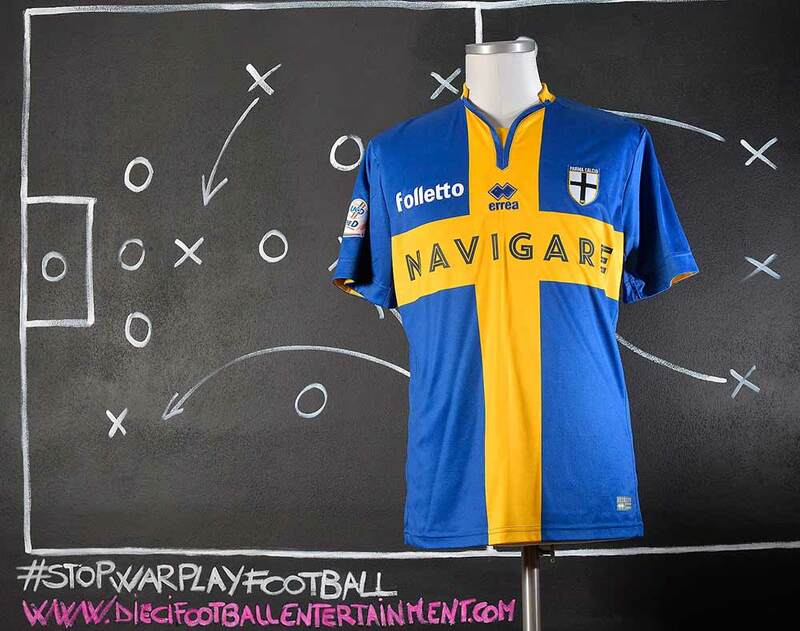 Parma narrowly avoided relegation following a strong end to the season, and also won the Coppa Italia, beating Juventus 1–0 at home, before losing 2–1 away from home, but winning on the away goals rule. 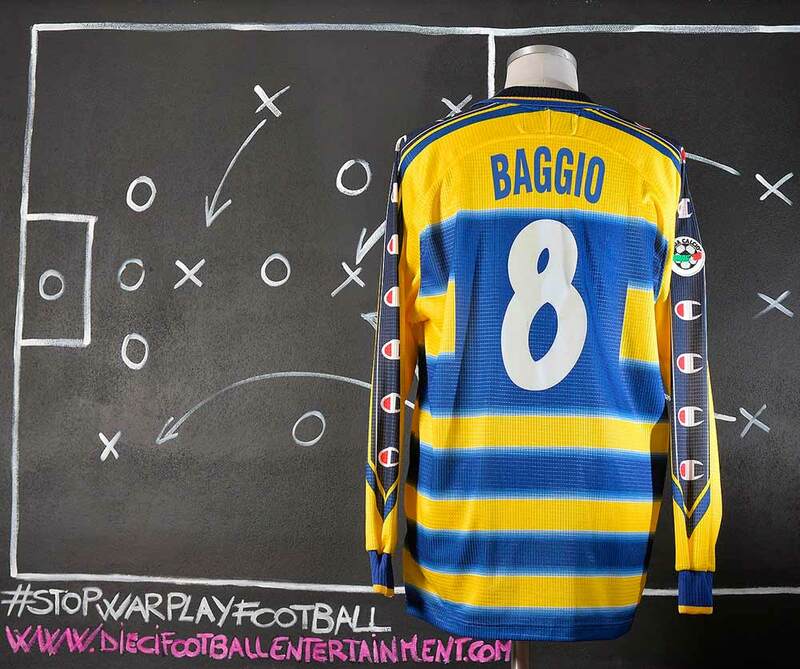 This shirt was never used by the team in any of the Tim Cup Final against Juventus. 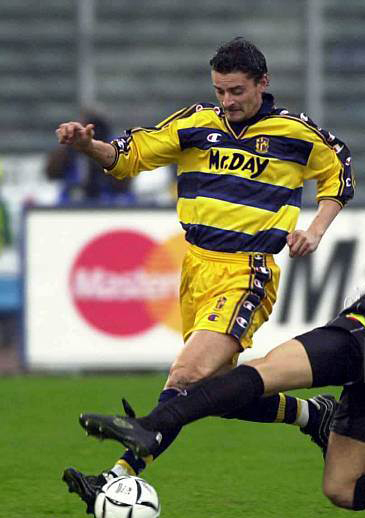 Both games were played by Parma with the blue away shirts. 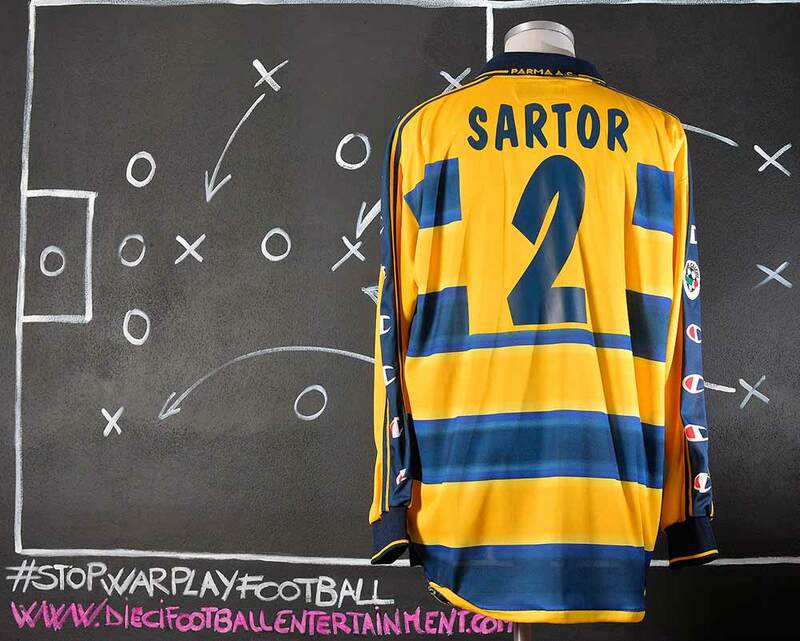 But this kind of shirt was prepared for the game. 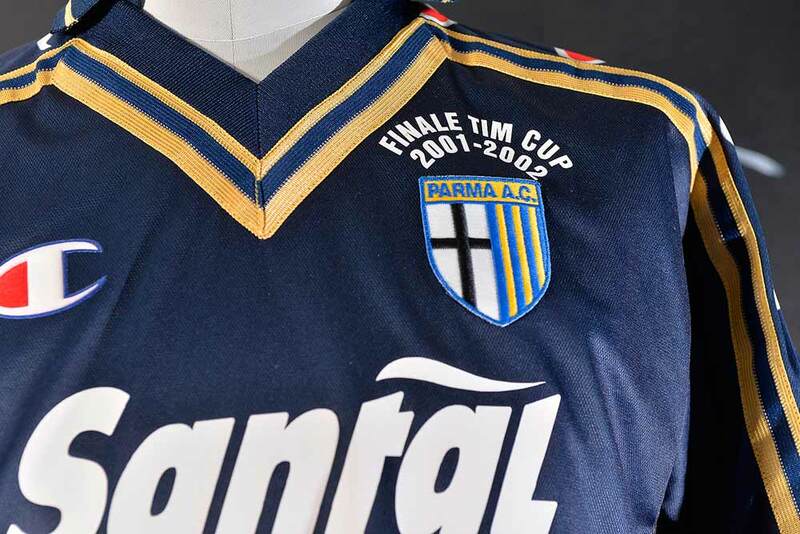 Please note that Parmalat sponsor on 2001-2002 shirts was only for the home Tim Cup competition as during the Serie A championship the team used JOY’s sponsor. 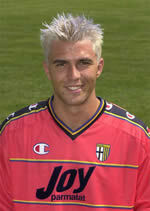 Following Toldo’s transfer to Inter, Frey was forced to find a new club. 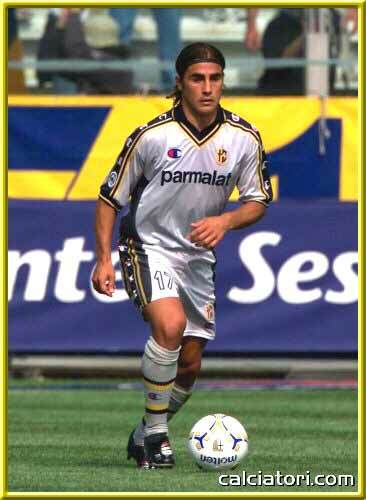 Frey transferred to Parma in the summer of 2001, for 8 billion lire cash plus Sérgio Conceição (Conceição was tagged for 32 billion lire, Internazionale’s official site claimed the cash was 10 billion lire), or 40 billion lire with whom he won the 2001–02 Coppa Italia. 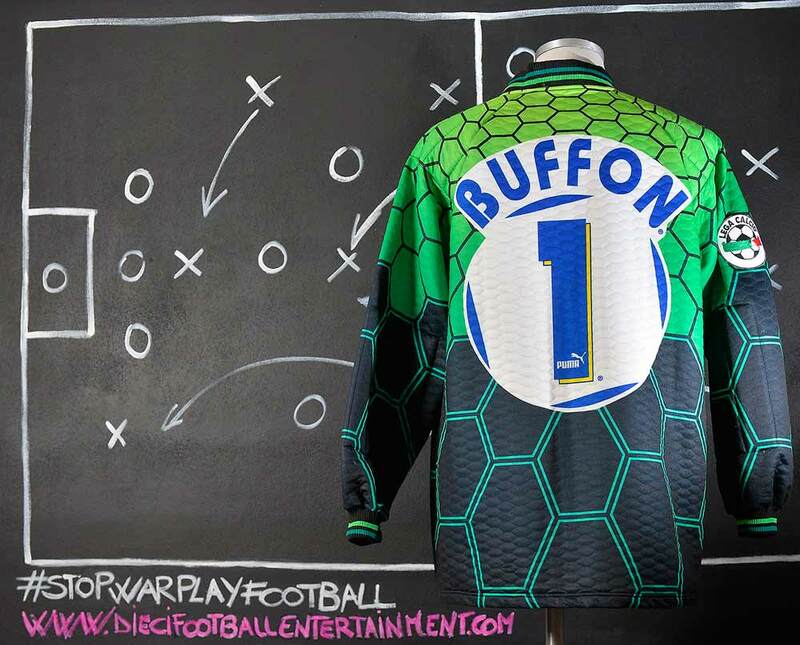 Frey was the replacement for Gianluigi Buffon who was sold to Juventus for a transfer fee of 100 billion lire which is currently the world-record goalkeeper’s transfer fee. 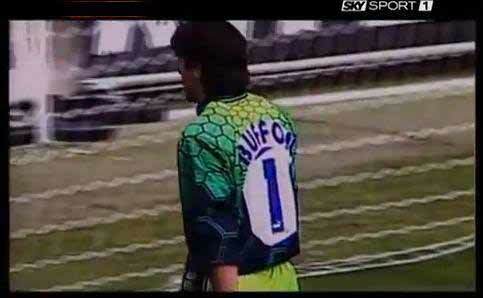 It was a difficult task for Frey to replace Buffon. 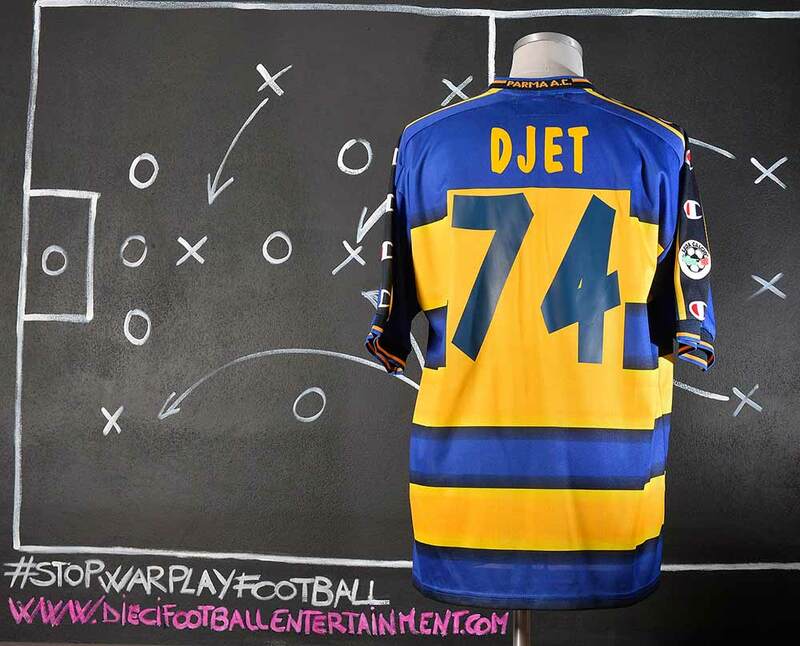 His experience in Parma was positive and provided ample opportunity for Frey to demonstrate his talent and justify the trust placed in him by the club. 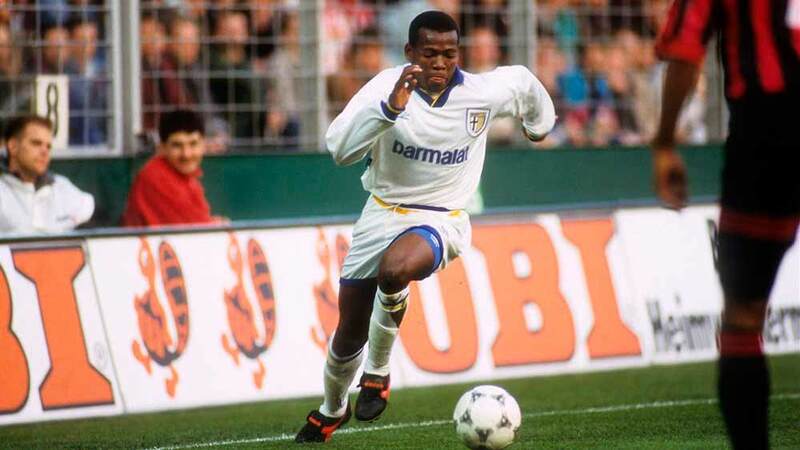 He became a key element of the squad and regularly played in the UEFA Cup. 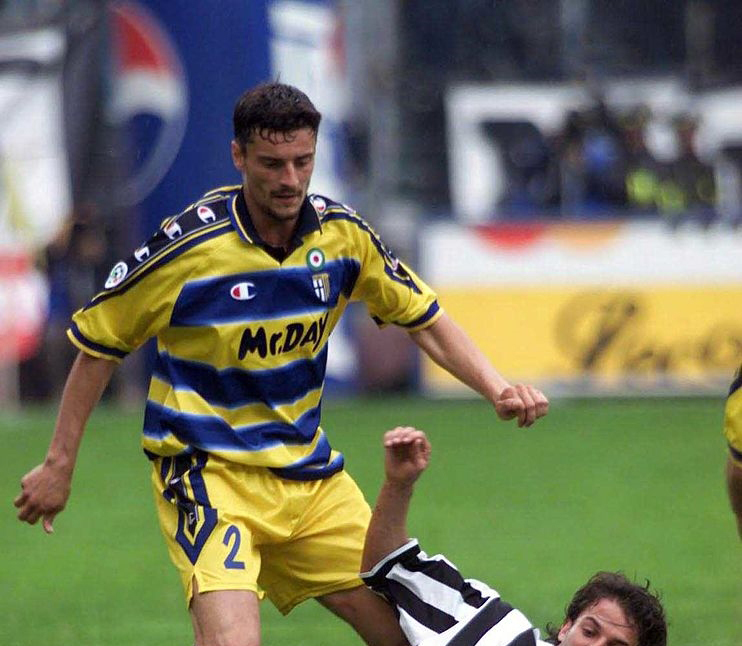 Frey won the 2001–02 edition of the Coppa Italia with Parma, leading the club to win the title for the third time since 1992; however, Frey never played in the tournament but he was always a substitute of Claudio Taffarel. 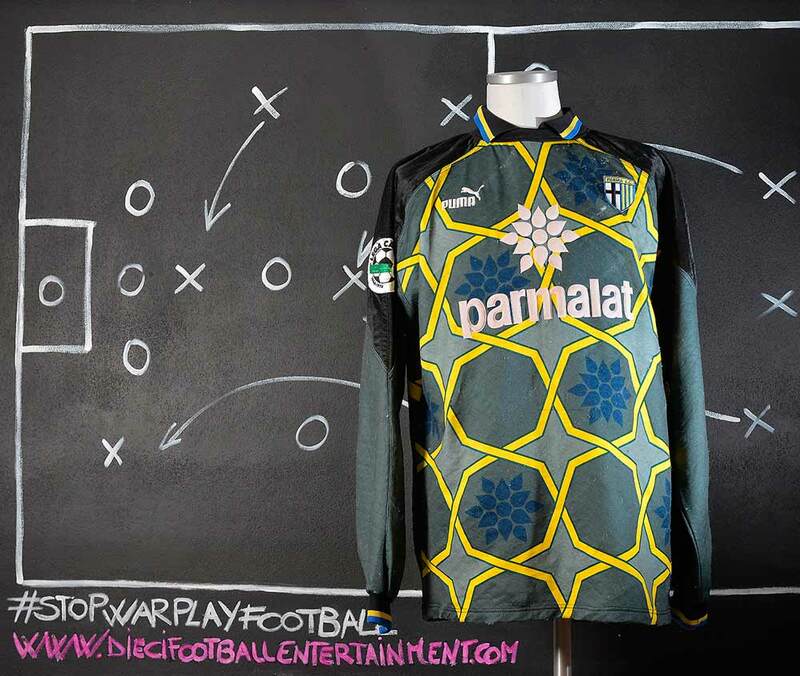 In 1990, Taffarel moved abroad and joined Parma A.C. in Italy, freshly promoted to Serie A for the first time in its history; he proceeded to appear in all 34 league games in the following campaign, as the Emilia-Romagna side finished in sixth position and qualified to the UEFA Cup. 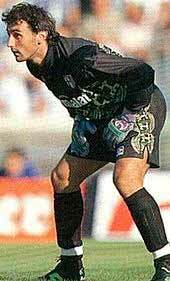 In 1993, Taffarel, now only a backup at Parma, signed for fellow Serie A team A.C. Reggiana 1919, being first-choice in an eventual narrow escape from relegation. Afterwards, he returned to his home country and played three years with Clube Atlético Mineiro. 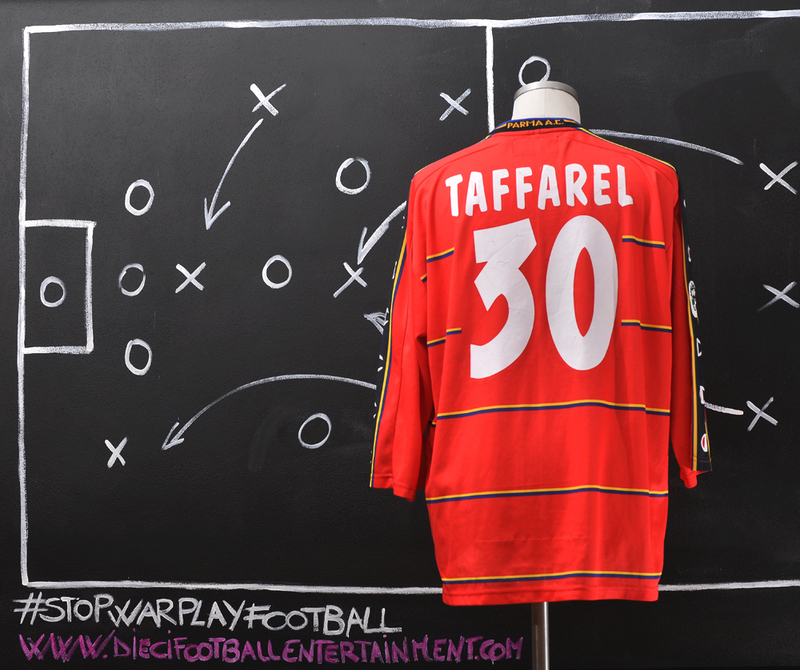 Aged 32, Taffarel returned to Europe and joined Galatasaray SK, winning six major trophies during his three-year stint, most notably two Süper Lig titles and the 1999–2000 UEFA Cup, a 4–1 penalty shootout defeat of Arsenal where he was chosen Man of the match (0–0 after 120 minutes); He closed out his career at the age of 37 with former club Parma, after one-and-a-half seasons as second-choice and after having refused an offer from Empoli FC: his car broke while he was going to sign the contract, which he later described as a “sign of God”. 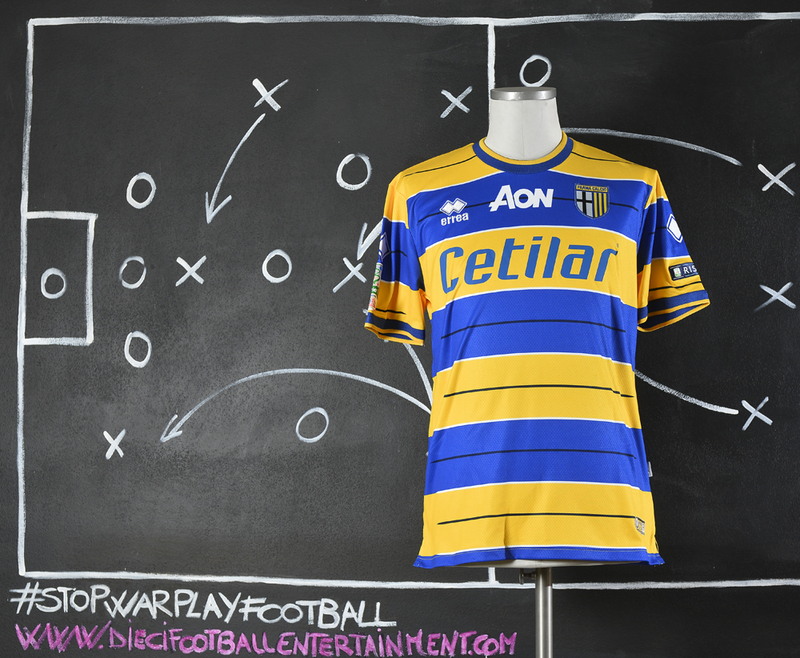 Parma Associazione Calcio regained its respect following a lacklustre Serie A and Champions League performance the year before. 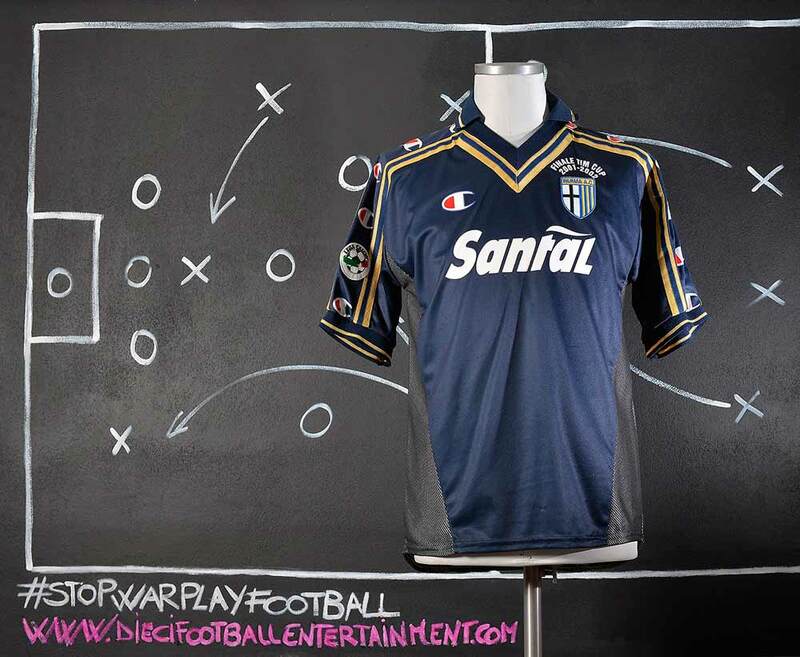 Under new coach Cesare Prandelli, Parma played an offensive 4–3–3 formation, in which new offensive signings Adrian Mutu and Adriano starred. Both made up for the departure of Marco Di Vaio to Juventus. 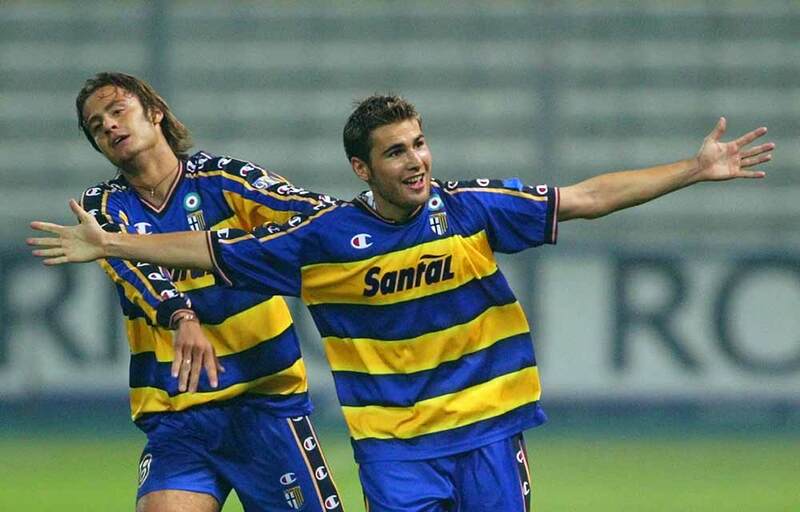 Mutu scored 18 goals from the left wing, and Parma accepted a multimillion-pound offer from Chelsea in the summer, which meant the Romanian international only spent a year at the club. 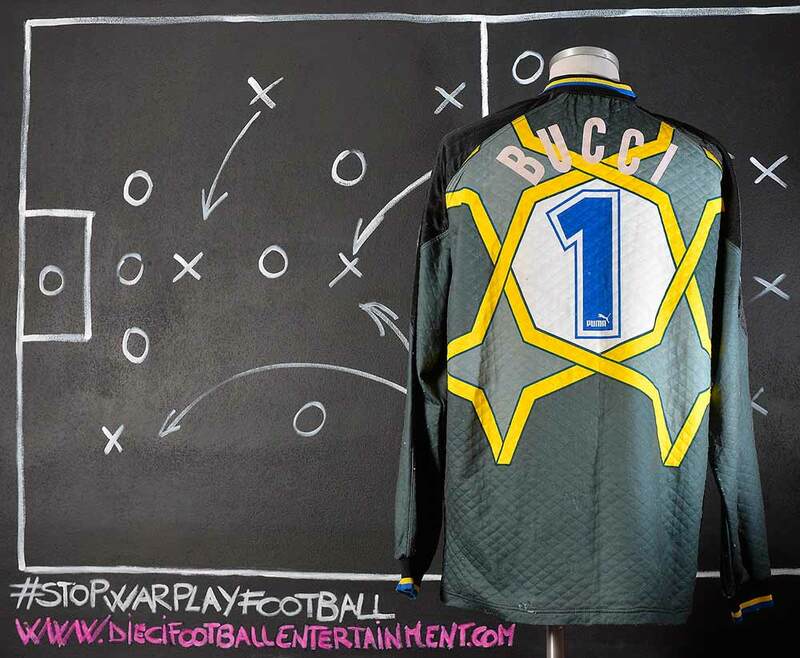 Also impressing were goalkeeper Sébastien Frey and young centre-halves Matteo Ferrari and Daniele Bonera, who proved to be acceptable replacements for departed captain Fabio Cannavaro, who had joined Inter in late August 2002. 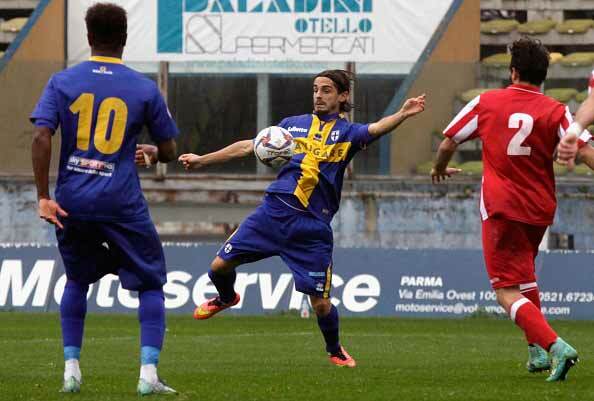 Parma finished fifth in Serie A and missed out on Champions League qualification to Lazio by four points. 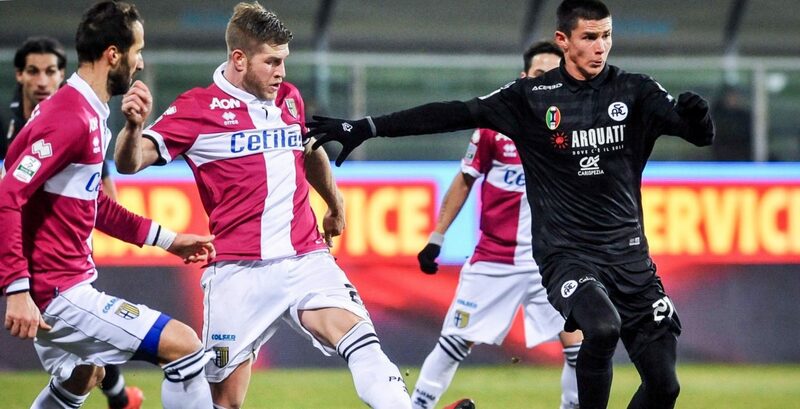 It had the upper hand on Udinese for fifth on goal difference, and was one point clear of Chievo in seventh. 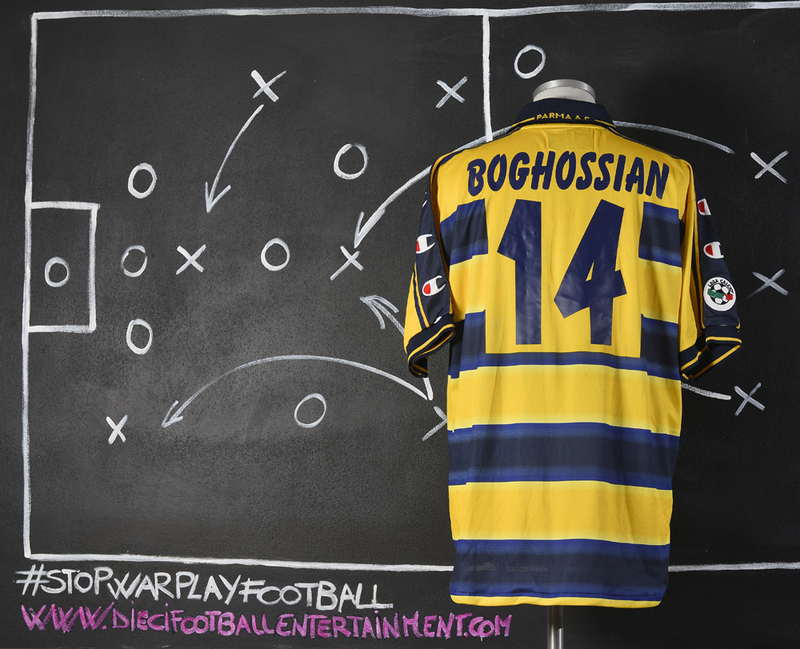 That solitary point qualified Parma for European football in 2003–04. 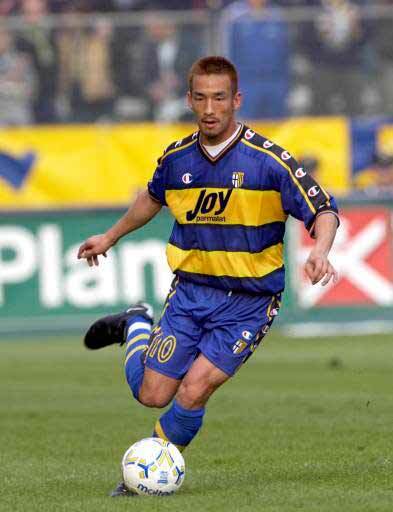 Parma also spent part of pre-season playing in the 2002 Amsterdam Tournament. 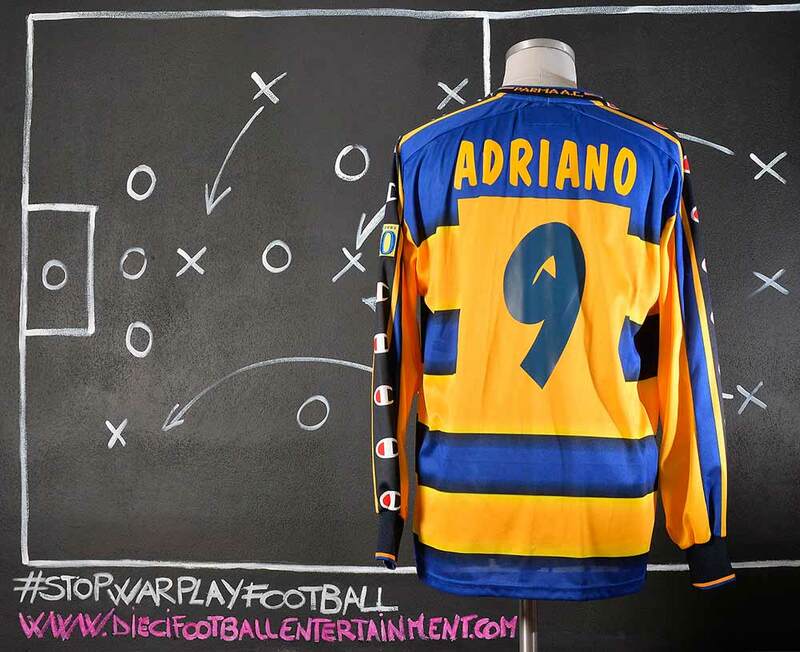 This season the team played with a special “90” badge on sleeve celebrating the 90th Parma’s anniversary. 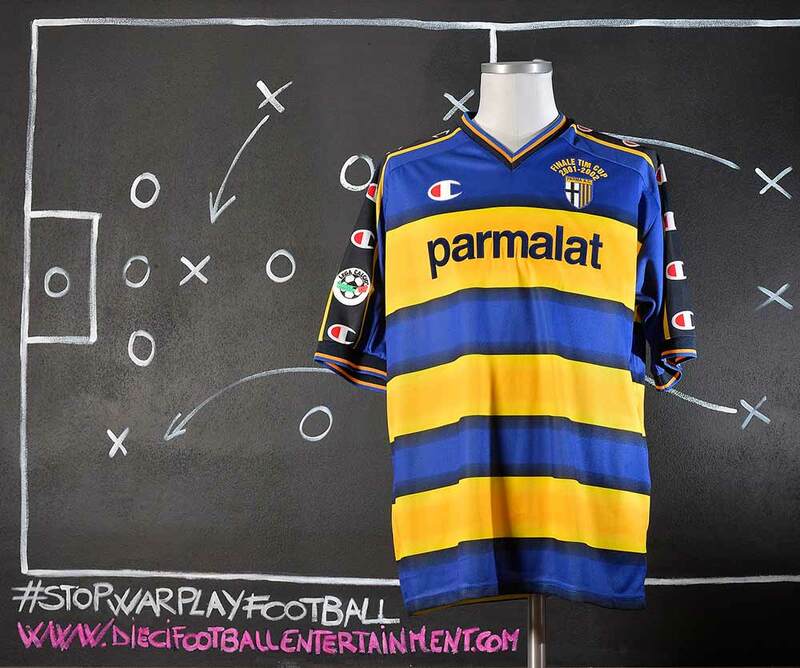 The 2013-2014 season was Parma’s Centenary. 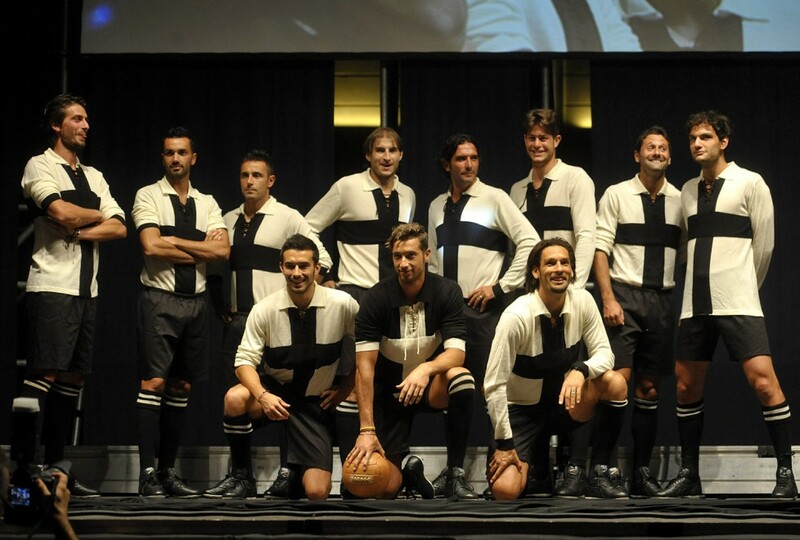 A special centenary shirt was made to honor the 100 years tradition of the club founded in 1913. 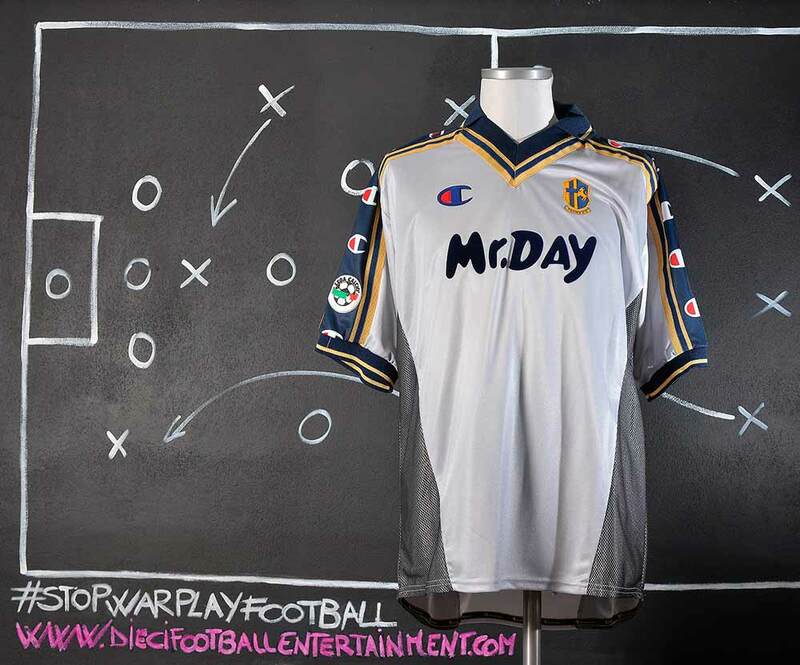 The centenary kit was produced by their shirt supplier Errea, but comes without a viewable shirt supplier branding, which features inside the collar. 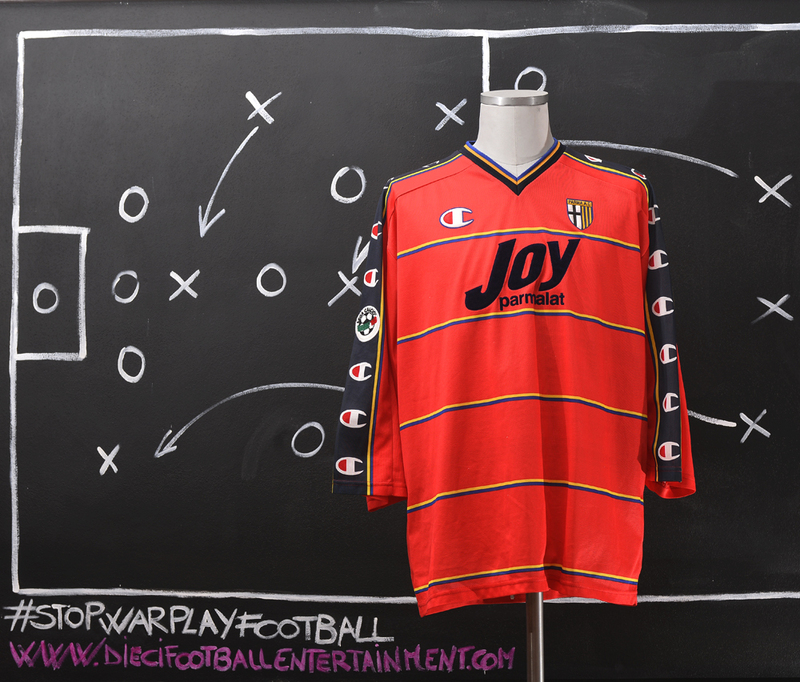 The kit was made of the same style of the original team first kit with no sponsor on shirts and no number on shorts. 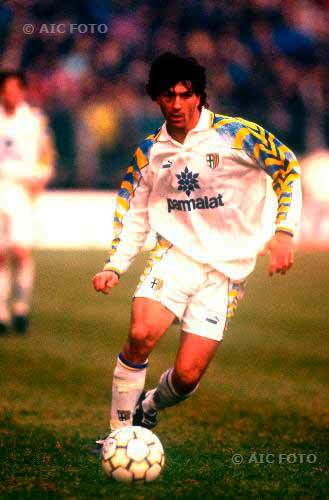 This kit was only used against Cagliari. 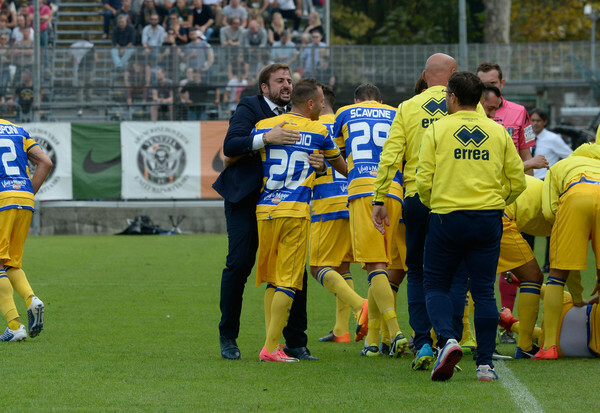 The 2015–16 season is Parma Calcio 1913’s first season in the Serie D since 1969-70. 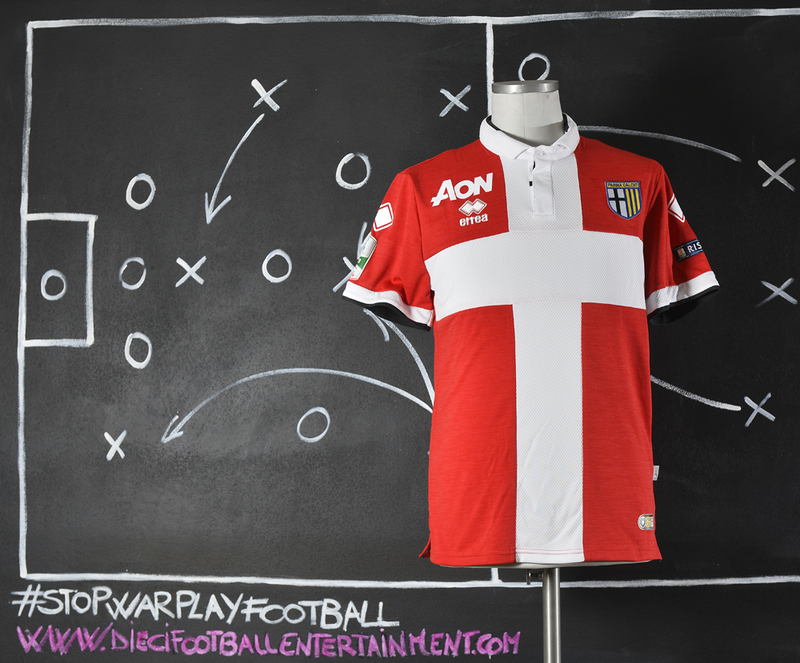 After having been declared bankrupt and relegated from Serie A at the end of the 2014–15 season. 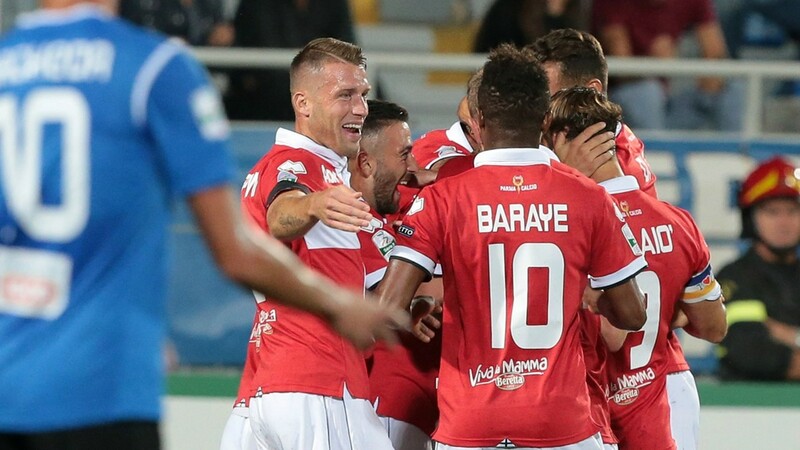 The team is competing in 2015–16 Serie D and the 2015–16 Coppa Italia Serie D. Due their first position at the end of the season the team will be back in Lega Pro (Italian 3rd Championship). 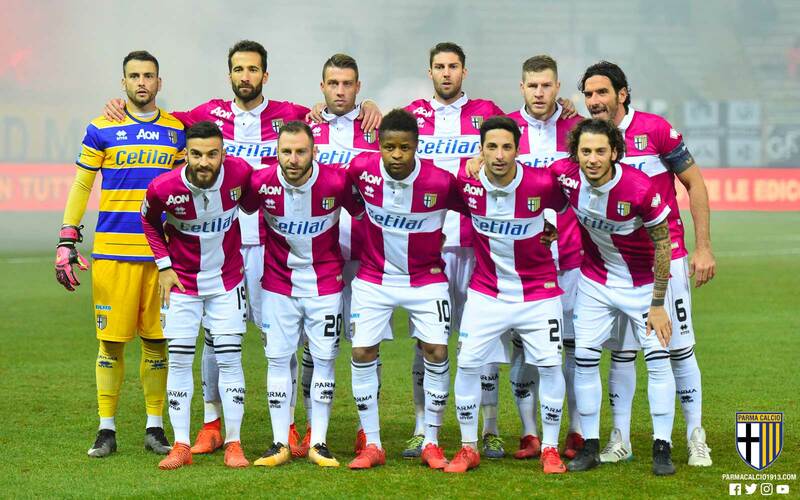 This style of shirt without sponsor was only used by the team against Novara on September 3rd 2017. 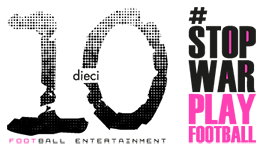 Since then “CETILAR” sponsor appeared on team’s shirts. 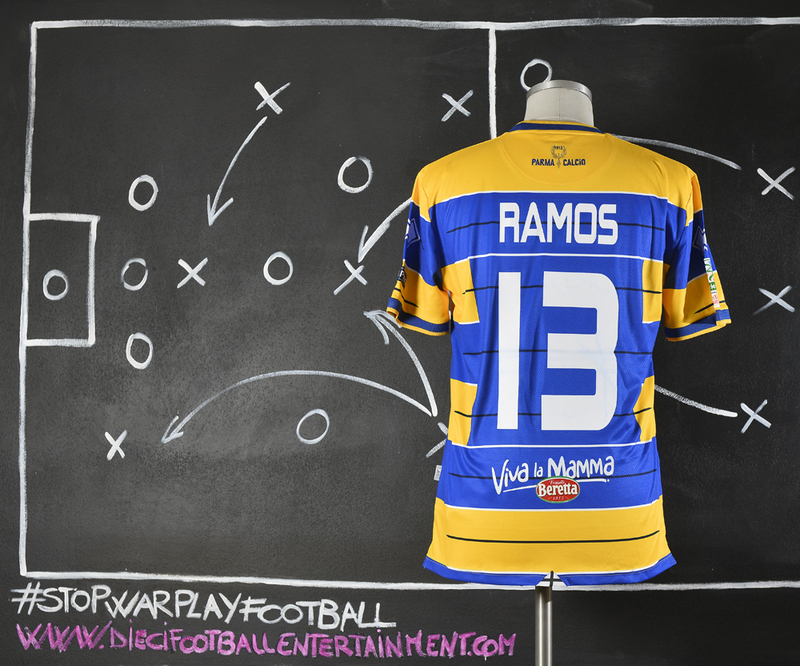 This Parma’s shirt is a special limited edition model released in pink color to support the “Maschi che si Immischiano” association that fight daily violence against women. 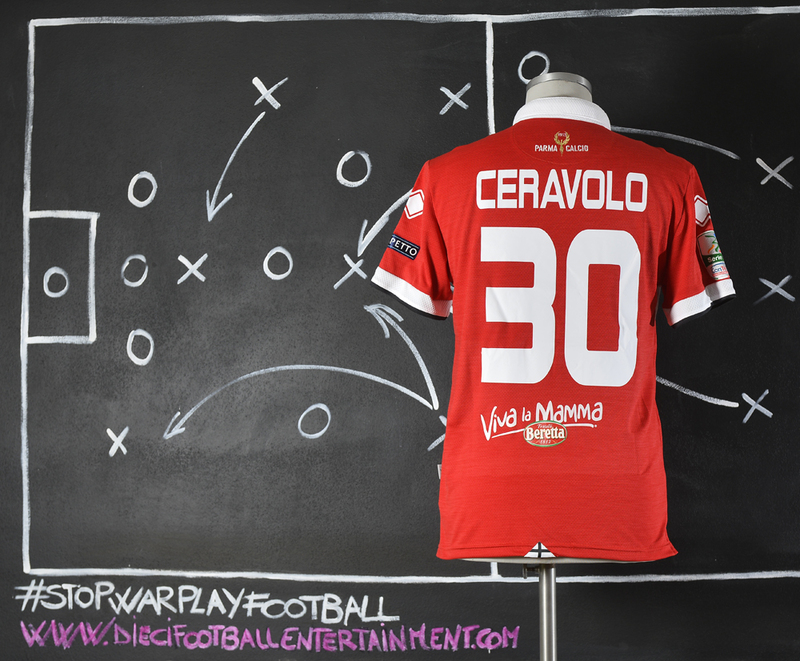 This shirt was only used once against Spezia on December 27th 2017 and never used anymore. 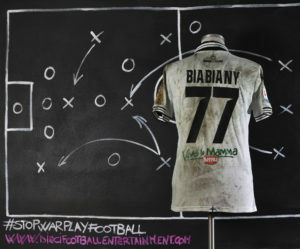 This shirt was worn by Jonathan Biabiany during the Serie A game against Sampdoria which took place in Genova on December 16th 2019. 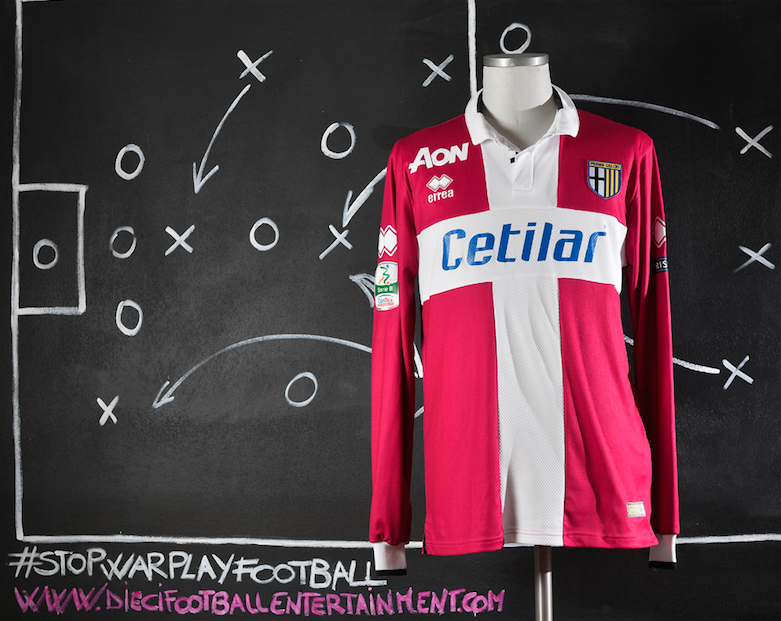 This shirt is a special released shirt to celebrate the 105th anniversary of Parma’s team and it has a special “105” embroidered on chest. Biabiany joined Parma three times in his career. 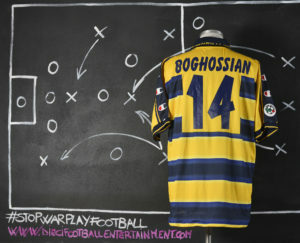 The first one was in July 2009, when the player was loaned to Parma, who had recently been promoted back to Serie A. 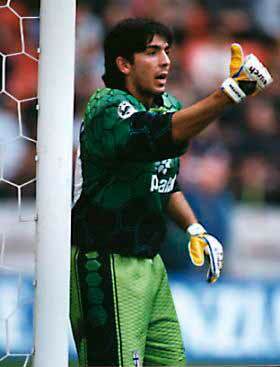 He featured in the first team for the first few league matches. 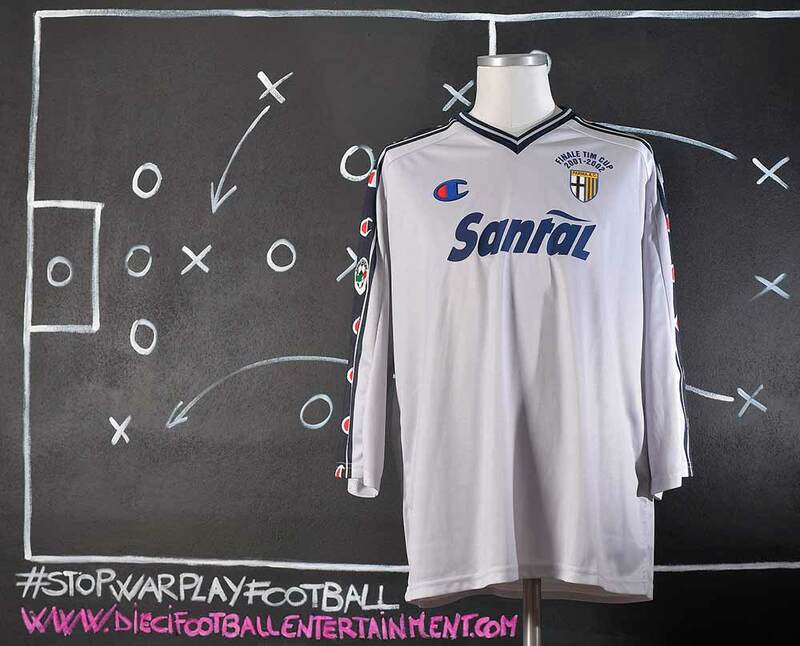 After international duty for France’s under-21 team, he did not play again for Parma due to minor injuries until late November. 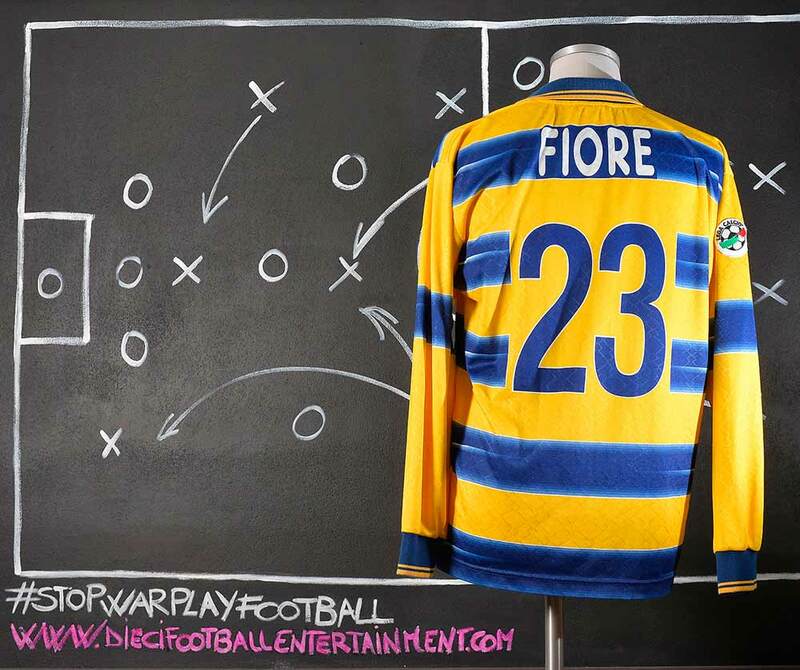 Notably, he scored both of Parma’s goals in a 2–2 draw with Genoa in Round 15, his first two Serie A goals. 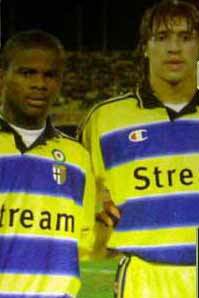 On 1 February 2010, Parma gained half the rights to Biabiany, as part of a deal that sent McDonald Mariga to Inter. Inter later revealed that Biabiany was valued €5 million at that time, thus it cost Parma €2.5 million for half of the rights. He ended the season with six goals and three assists in 30 appearances. The second one was On 24 June 2011 when Biabiany was signed to Parma on a loan deal with an option to purchase him outright from Sampdoria, a year after his departure from the Emilian club. 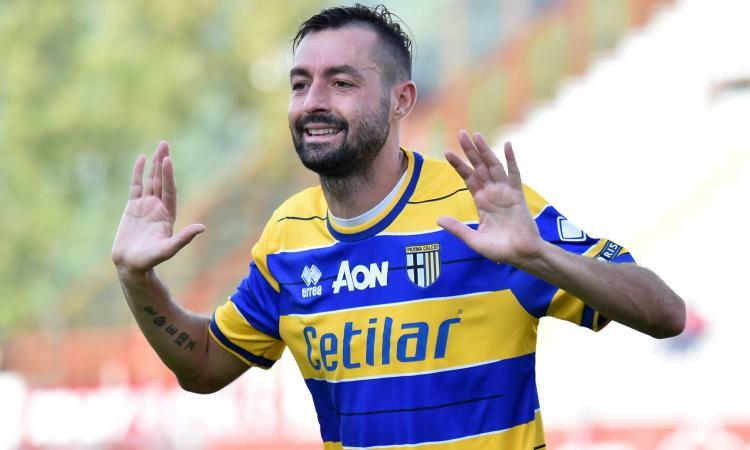 He went on to feature in every Parma league game that season and the summer of 2012 saw him move to Parma in a co-ownership deal for €2.5 million on a three-year contract. On 2 February 2014, Biabiany extended his contract to 30 June 2018. 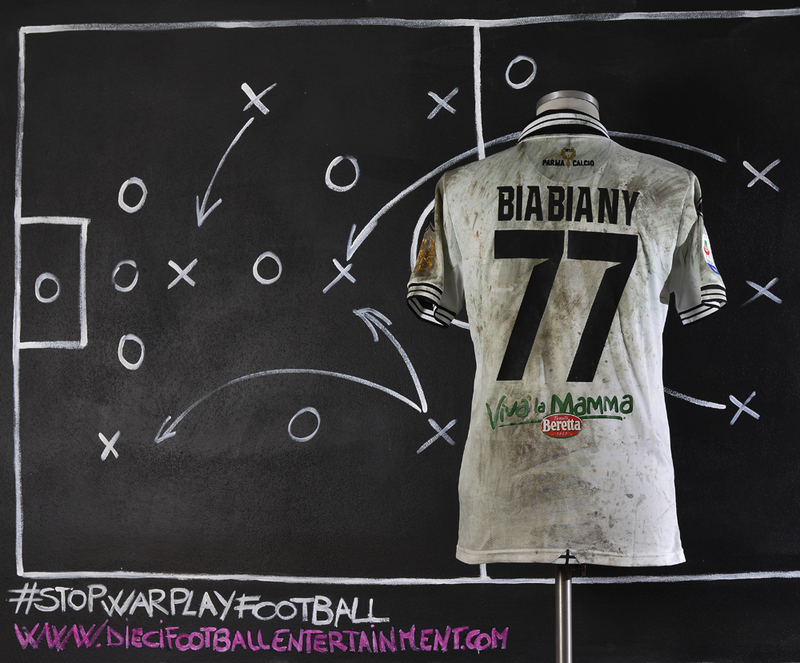 On 20 June 2014, Parma acquired Biabiany outright for another €1 million. 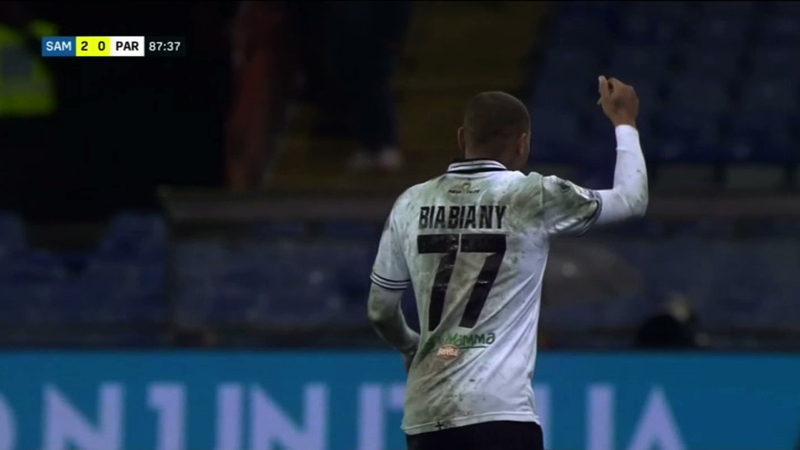 After a strong 2013–14 season, Biabiany was set to move to Milan on the last day of the 2014 summer transfer window. After posing for a photo with the Milan scarf outside of the club headquarters, Biabiany failed his medical at what was set to become his new home with the Milan side’s medical staff uncovering a heart problem the player had. After extensive testing, doctors indicated that the Frenchman had an irregular heartbeat and would miss the first half of the season in order to have his condition treated. Biabiany returned to training in February 2015. 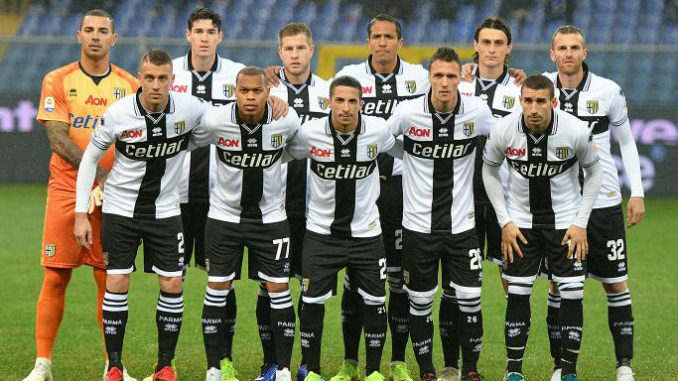 On 11 April 2015, Biabiany terminated his contract with Parma by mutual consent. 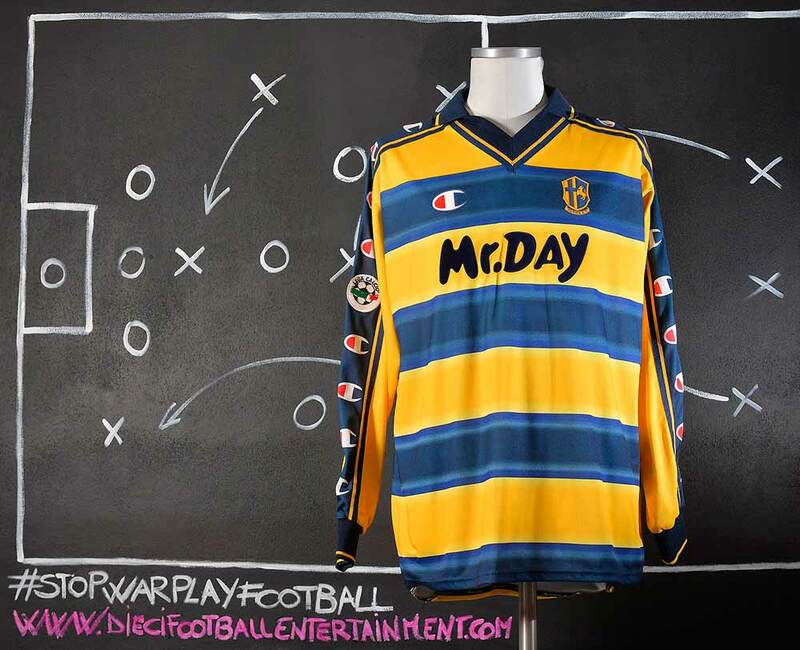 Parma was declared bankrupt in mid-season. And the third one was on 7 August 2018 when Biabiany signed a one-year contract with Parma in the first season of team’s return in Serie A.